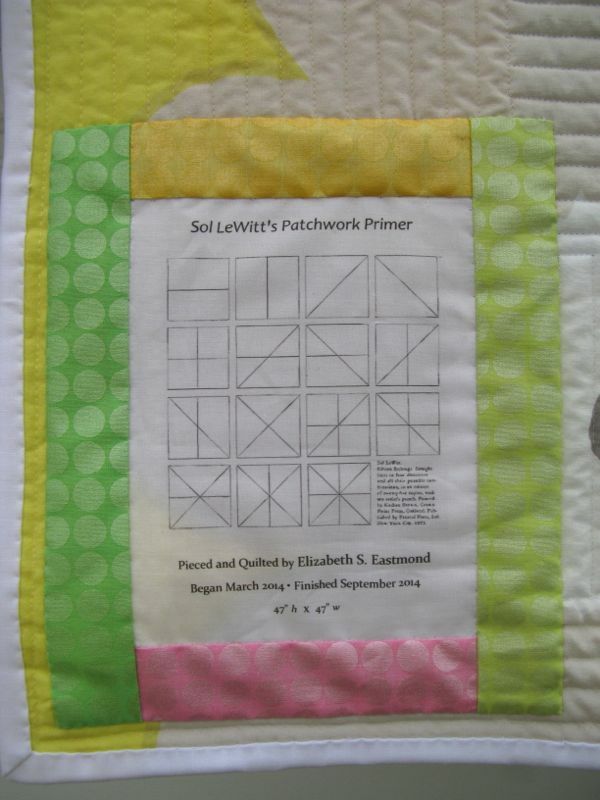 Posted on September 8, 2014 by Elizabeth E.
I started in the middle, quilting in between the lines of dots. 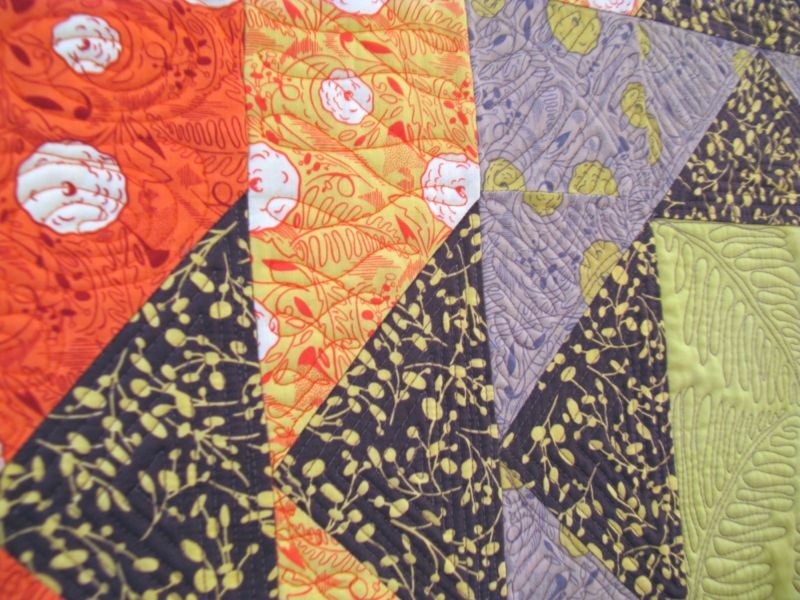 In the neighboring color, I sewed the other direction, and so on, around the quilt. 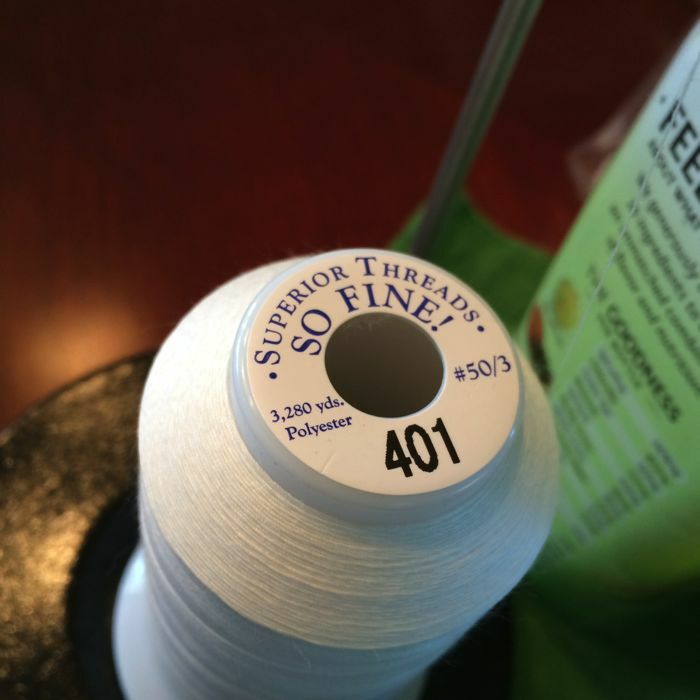 I changed out thread on each color, but used my go-to thread in the bobbin: Bottom Line, by Superior Threads. 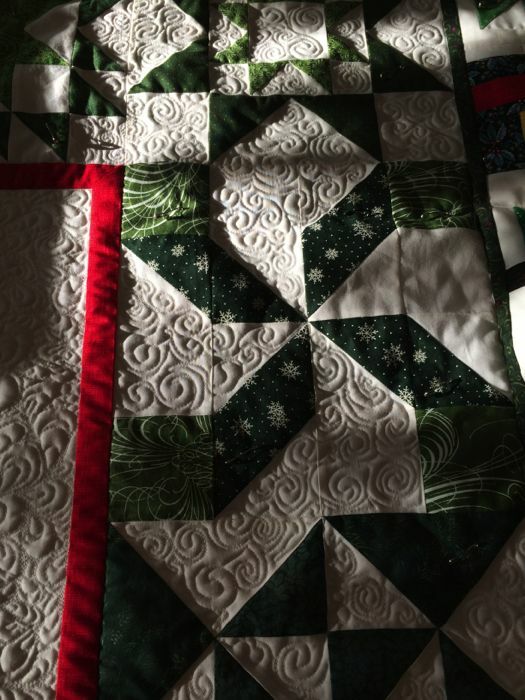 I lowered my upper tension to keep the thread balanced in between the layers so no white popped up to the top and no colors popped through to the back. White binding (what else) goes on next. 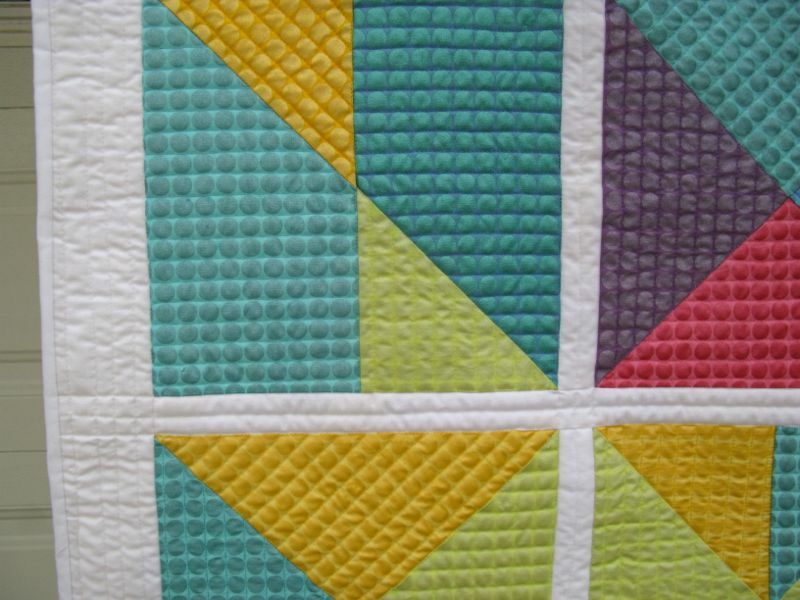 I think with the combination of the dots on the fabric and the quilting, it reminds me of what I envision a 1960s quilted jacket might have looked like. I’m sure my sisters had them. 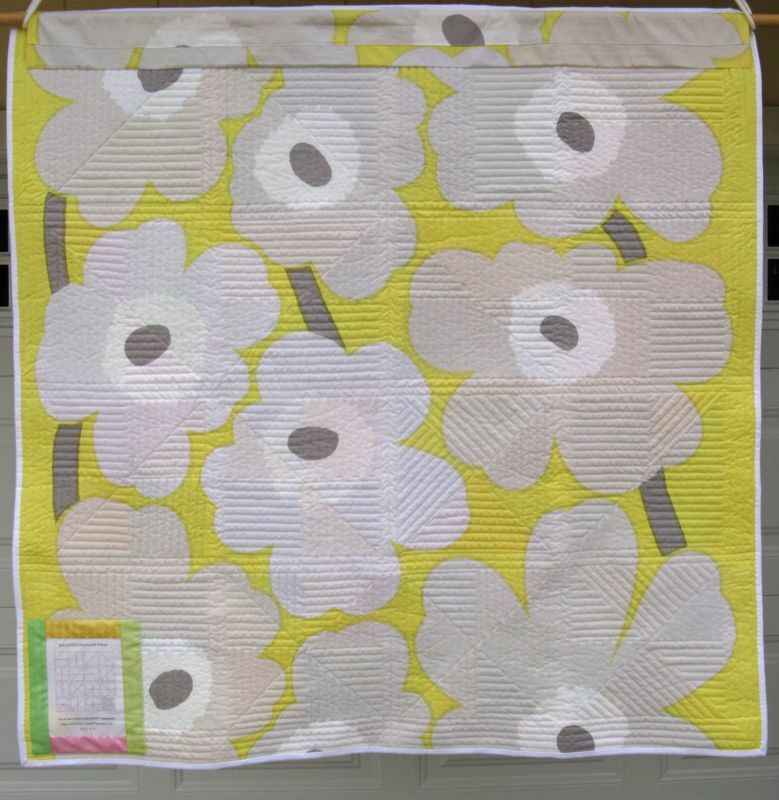 The backing is a Marimekko fabric of large grey blossoms over an acidy-yellow background. I included the picture that inspired me on my label. 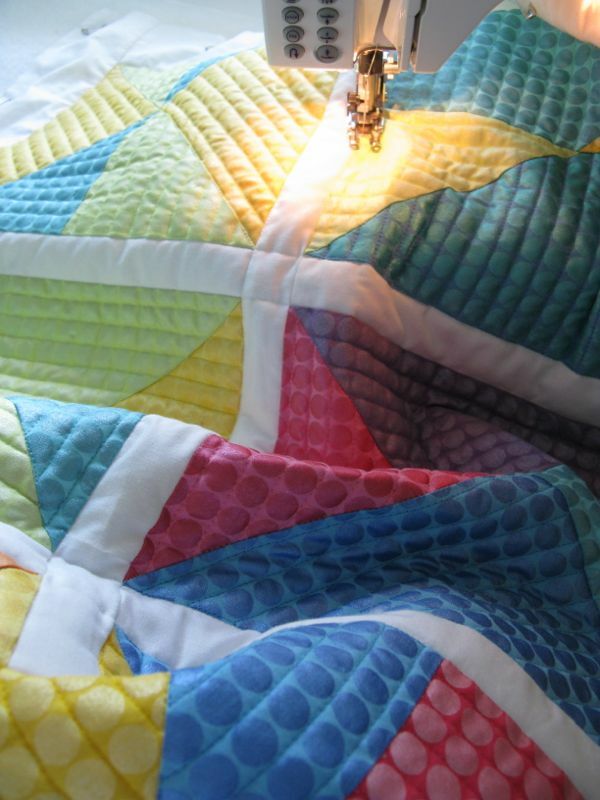 I love the “stained glass” look of quilts, shot from the front when they are illuminated from the back. It’s nice to have a finish! 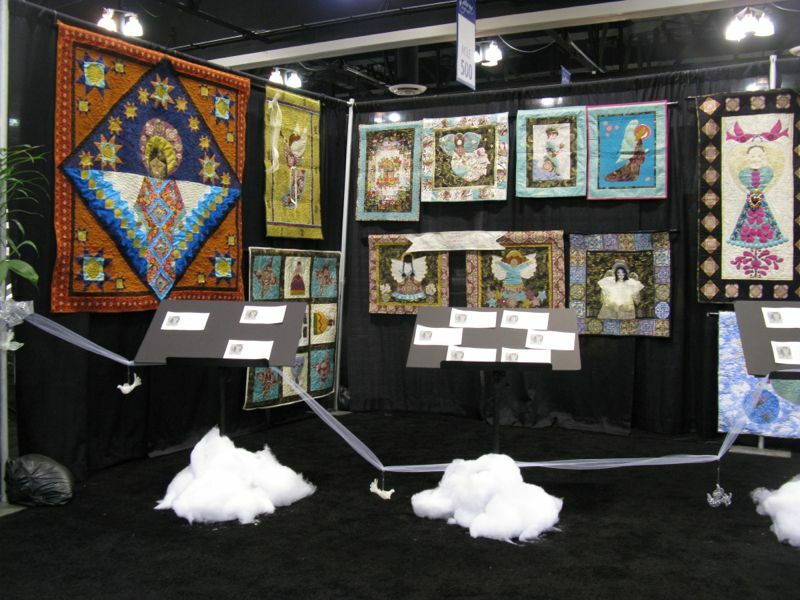 Posted on February 3, 2014 by Elizabeth E.
No matter how many times I go, I’m always excited to walk in the front door of the convention center, see these hanging quilts (this one is by Nancy Boyce Geese in the Fields) and know that the quilting game is ON, specifically that the Road to California show has opened for another year. I’m trying something different this year. 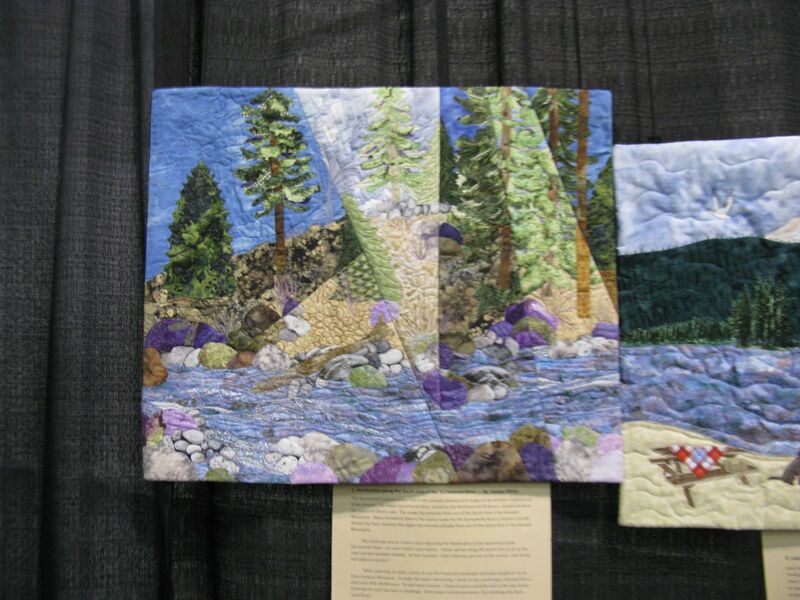 I noticed that the Road to California has put up good, high-resolution photos of the quilts that far surpass any of my snapshot renditions (largely because they are able to go around earlier, with a tripod and a good flash camera), plus they have many of the quilts that I may pass by. 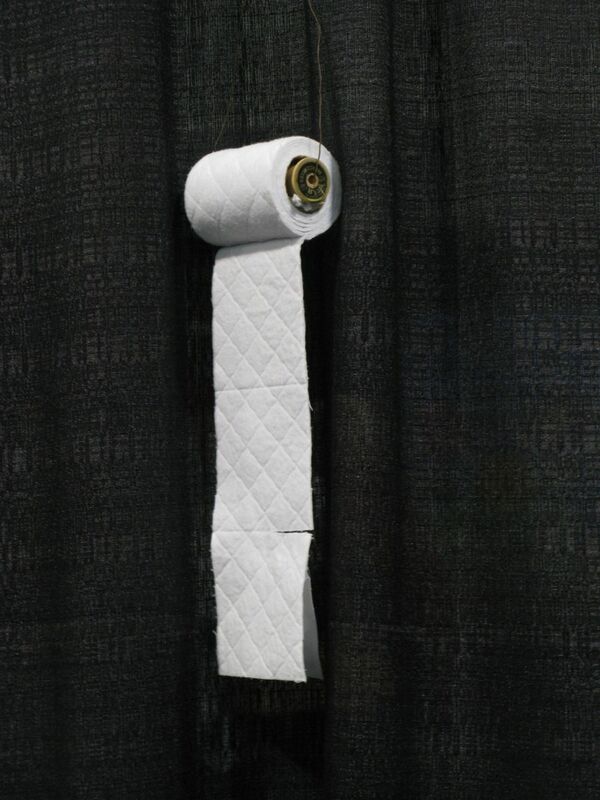 Click *here* to go to that listing and enjoy their show. What I’ll do below, is list some of the ones that interested me, make some commentary here and there (good and bad) and sum up the social aspect of the show. 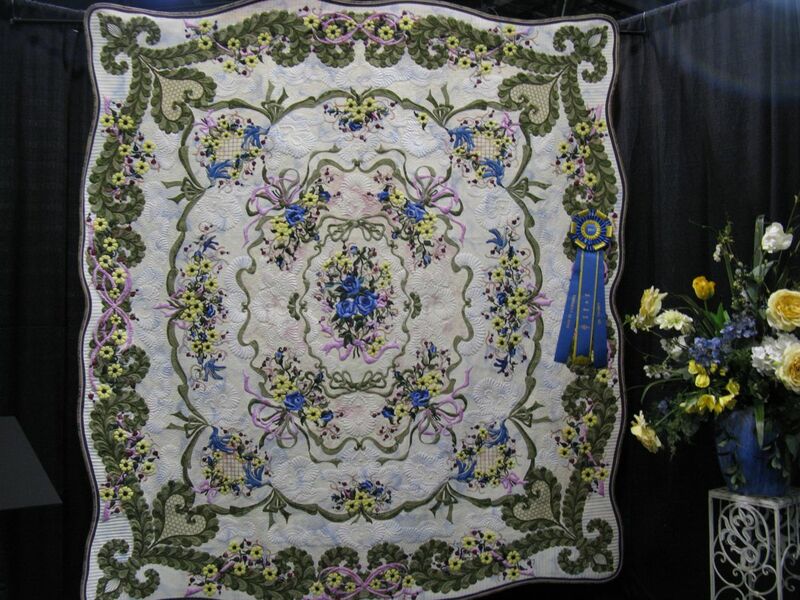 This is the Big Kahuna of winners, and no surprise, it was won by Sharon Schamber. 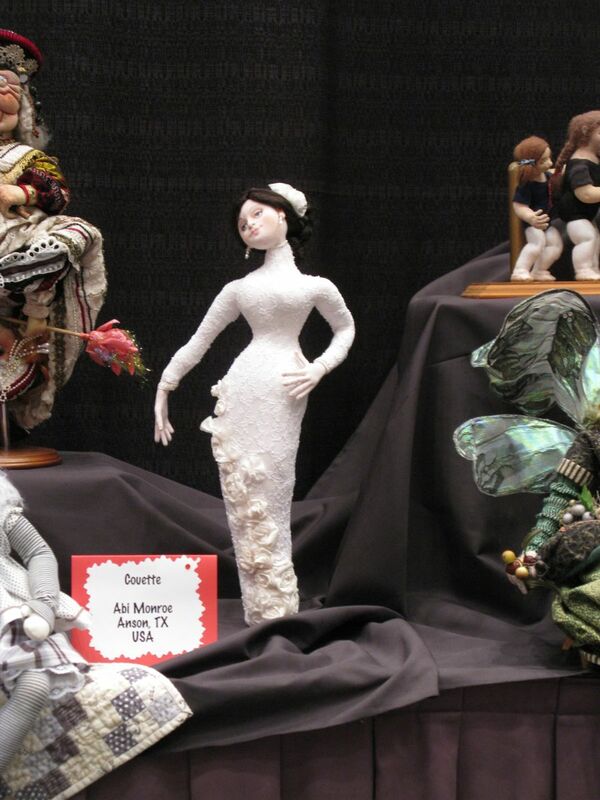 Titled Once Upon a Time, she started making it in 2000, then put it aside for over 10 years. 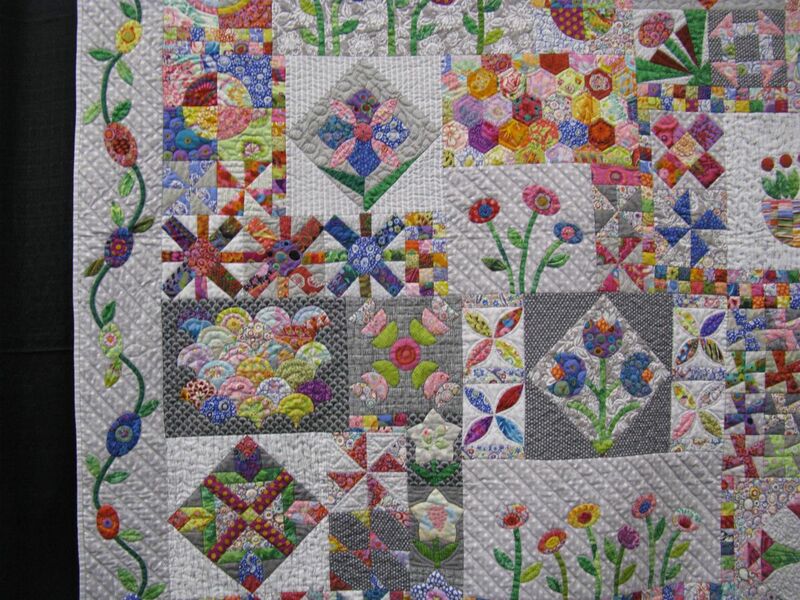 I’m interested in her quilting, for that it how she gained her fame. 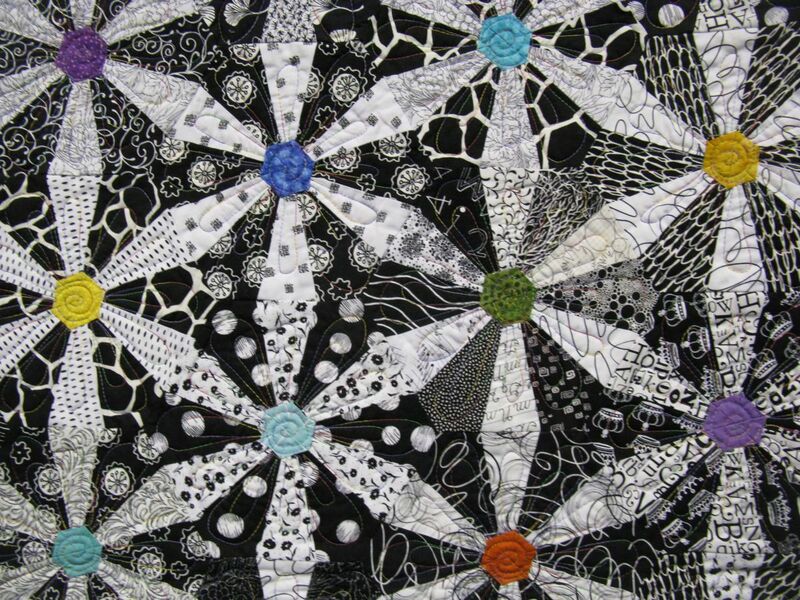 Cheryl See’s quilt, Tatted Hearts had 20 yards of her great-grandmother’s hand-tatted lace and a doily. 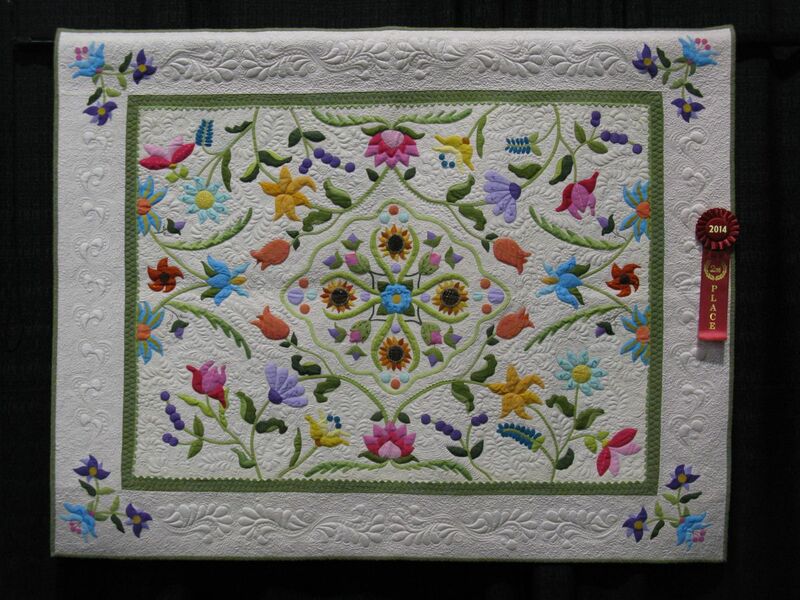 Never could locate the doily, so I assume it was used in the construction of this whimsical quilt, but the yards of tatting are evident. 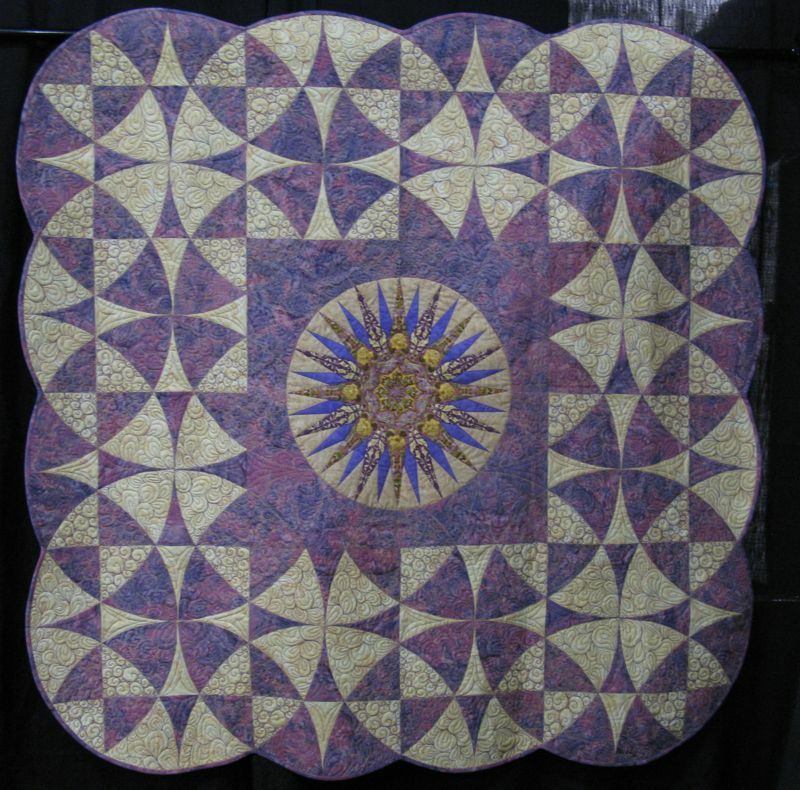 Magic Carpet Ride reflects the childhood of maker Janet Wilson, when she noted that she grew up with Turkish carpets all over their floors. 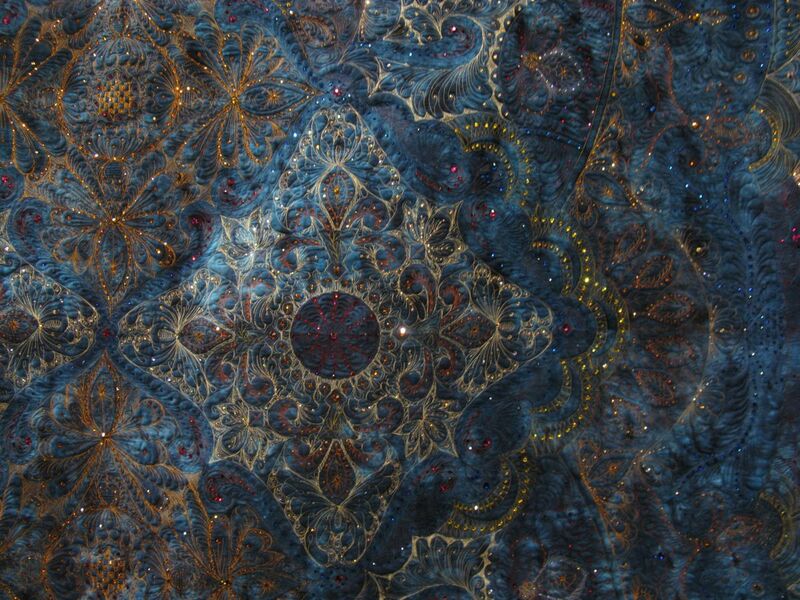 She set out to create a design that was a colorful quilted, version of these carpets. 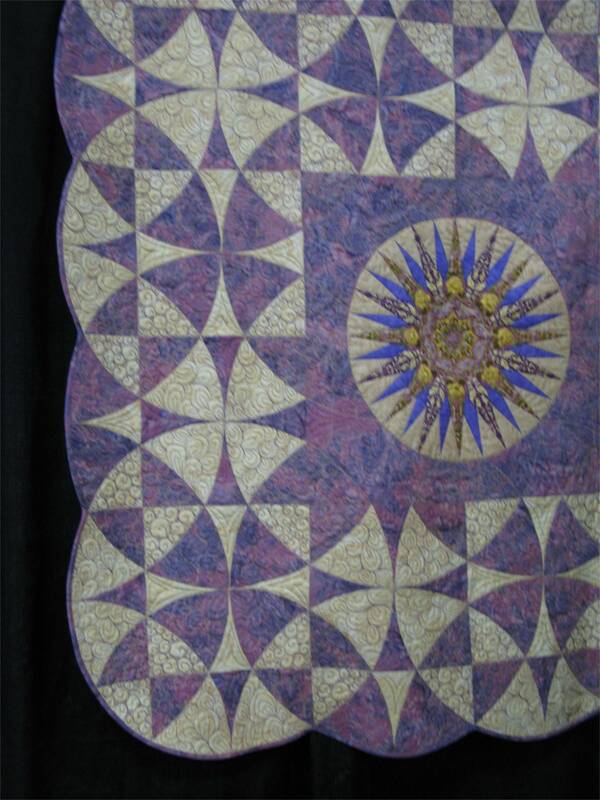 This is a quilt that gets a thumbs up on the use of crystals (generally, I think it is WAY overdone in show quilts), as they were used to be a integral part of the design and only for accent. 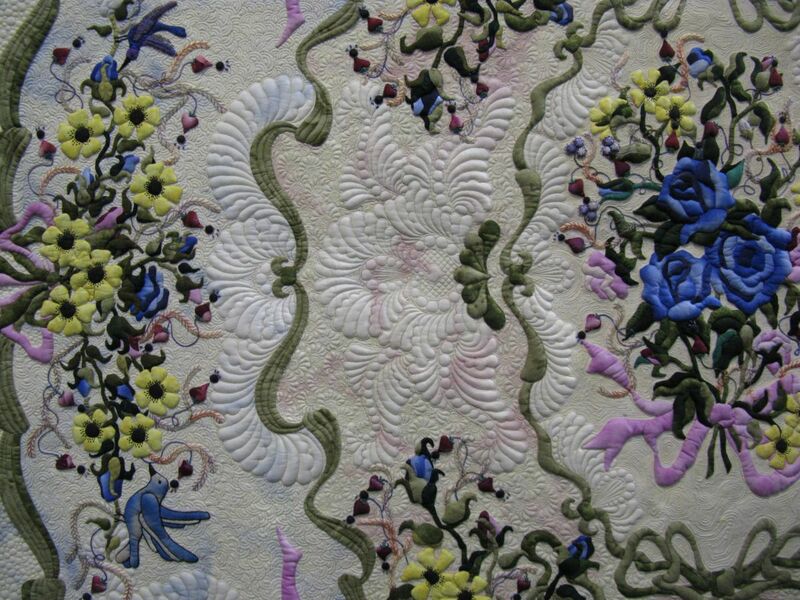 But using French knots would have been okay with me too, in those spaces where she put some bling. 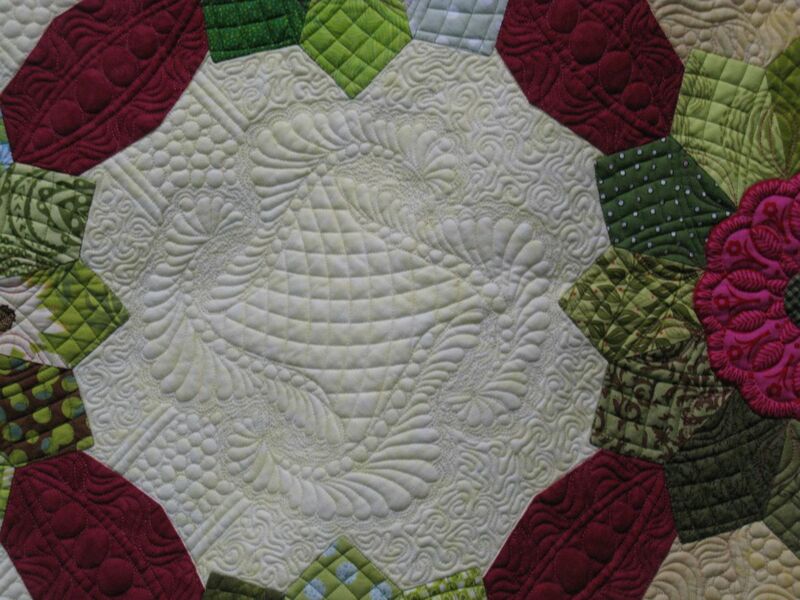 Zen Garden was made and quilted by Margaret Solomon Gunn, and is based on the “Blooming Carpenter’s Star.” She noted that all the fabrics she used were from her stash (certainly noteworthy!) 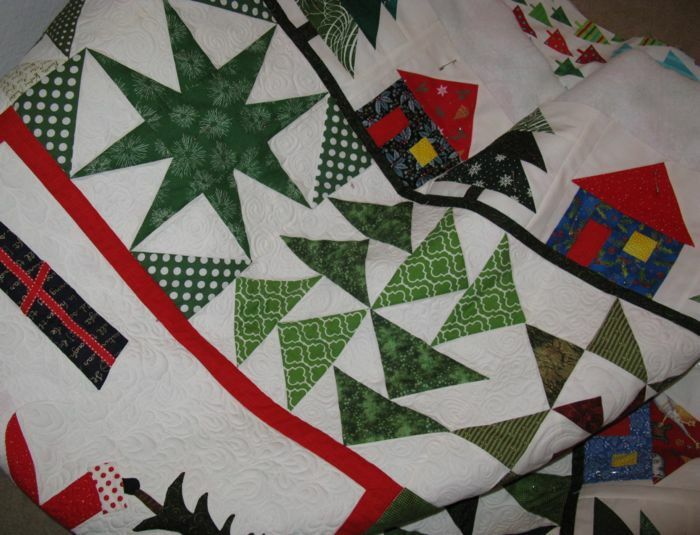 and she used a longarm machine to complete the quilting. And here it is: Willow, by Debra Crine. 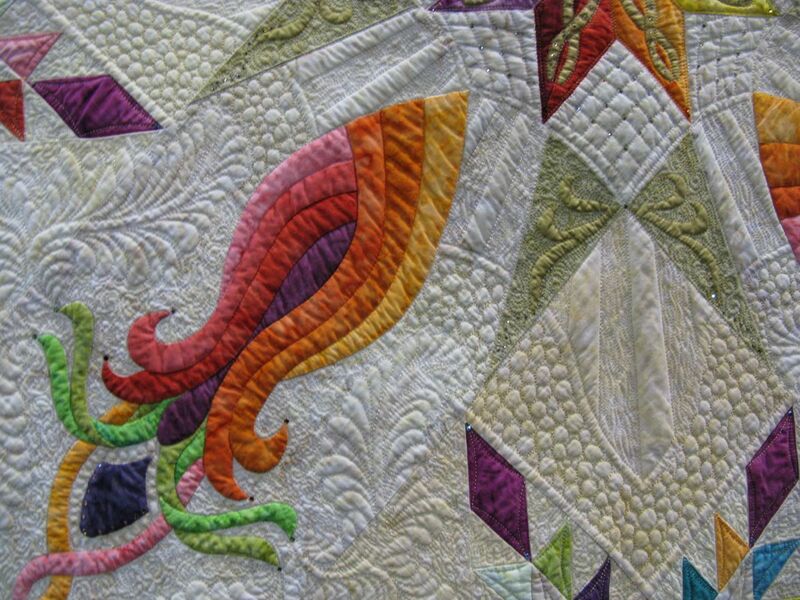 She used hand-dyed fabrics over a silk background, and her technique was to fuse them, then appliqué them with a double blanket stitch. 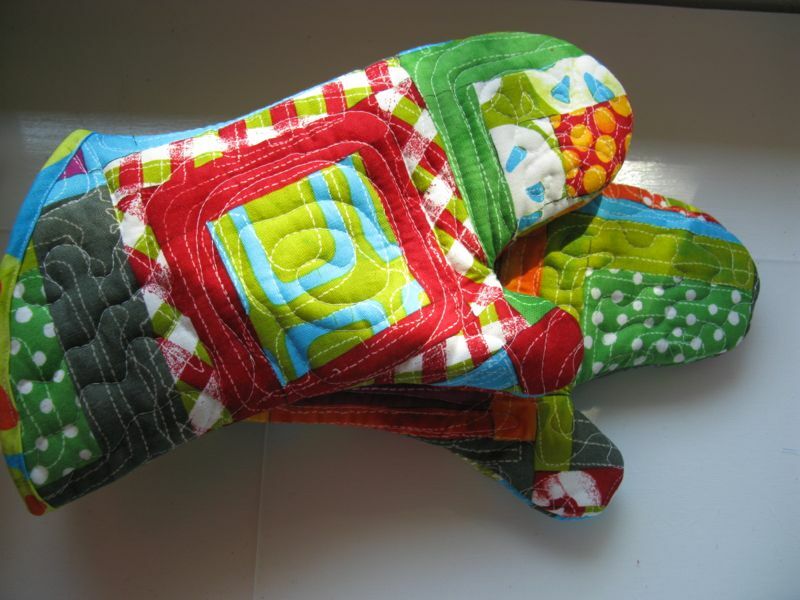 She also quilted it. 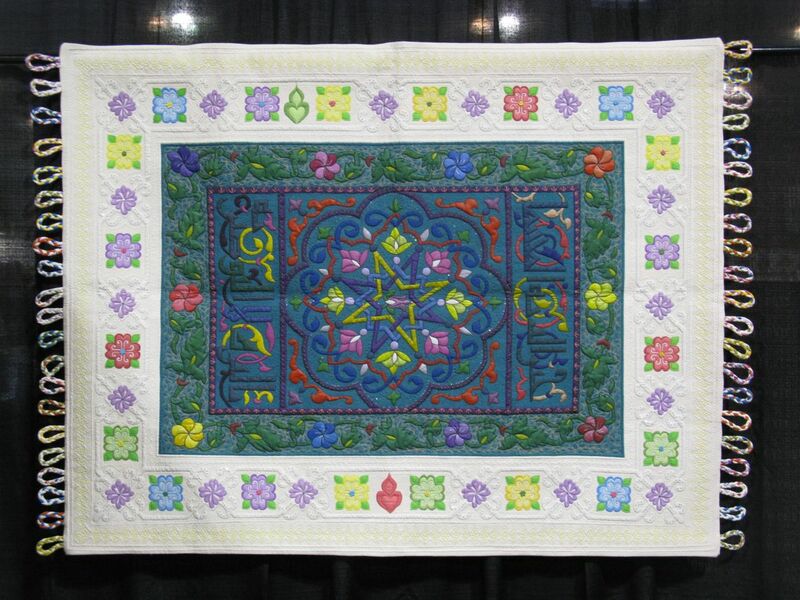 This was not a large quilt, nor was the Magic Carpet Ride. 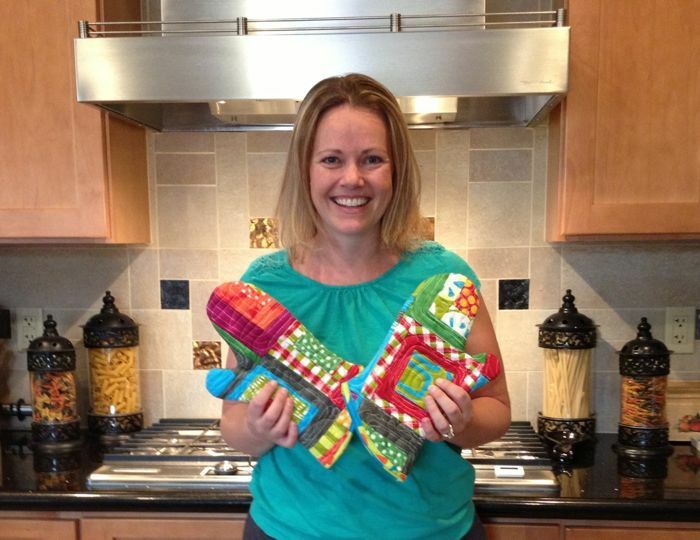 Crine doesn’t say whether it was a domestic sewing machine (DSM) that she used to quilt it, or a long arm. 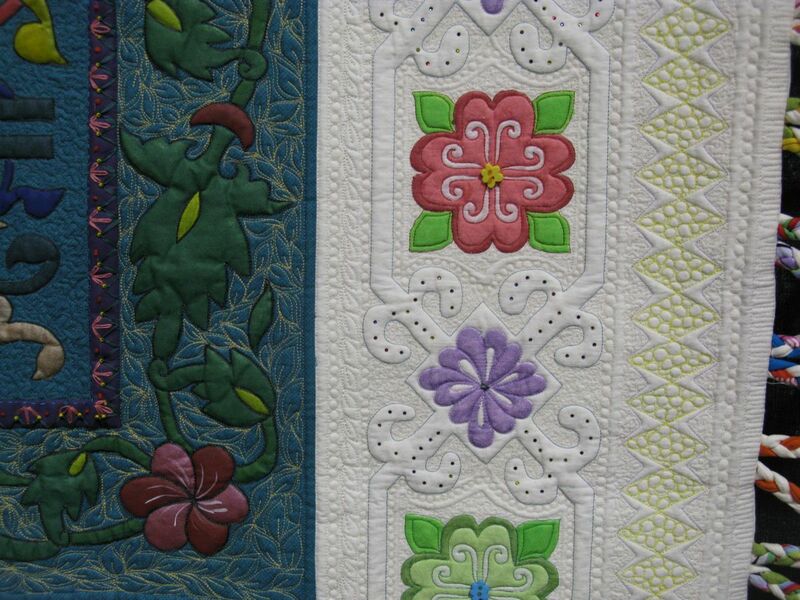 Of course, my bias is to see people quilting on a domestic machine, as that’s what most of us have. 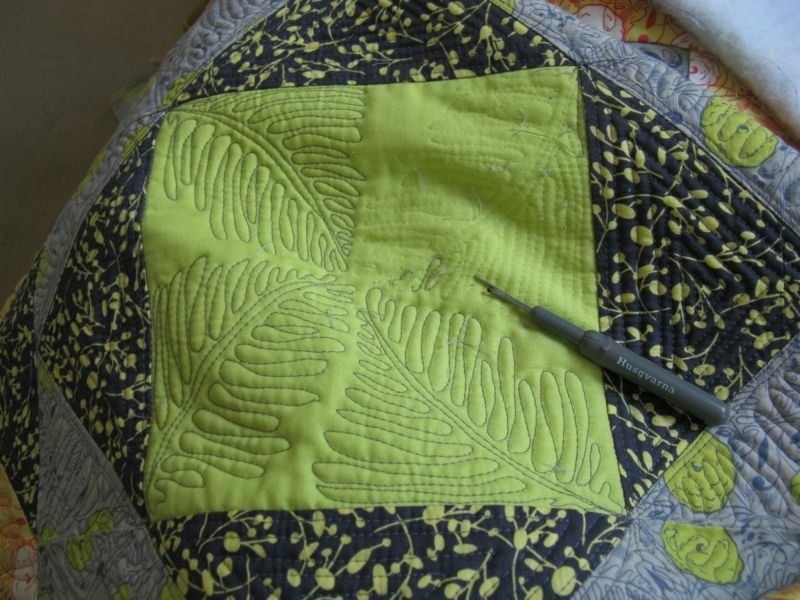 I love reading Linda’s blog, Flourishing Palms, as she is trying to adapt many of the longarm techniques to our DSM, applying some of their tricks and tips so that the resulting finish can have a similar technical excellence to them. 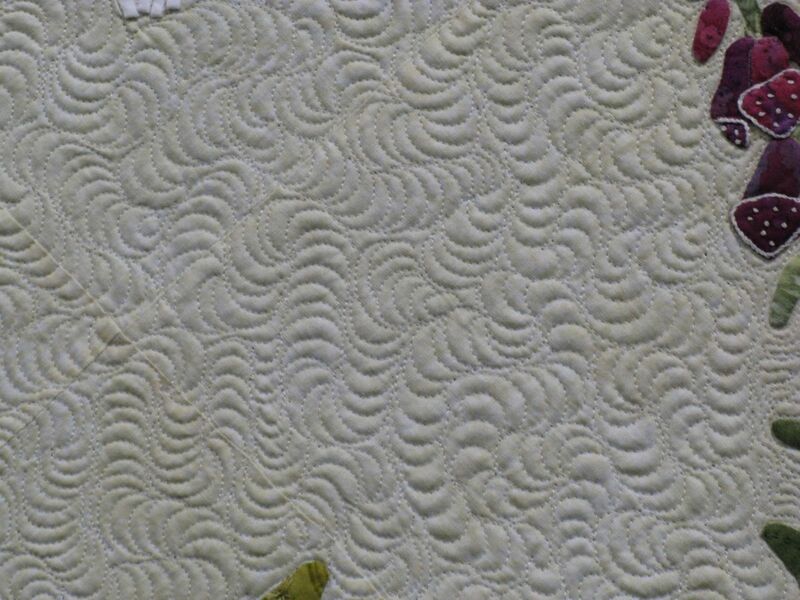 I began to look for quilts that indicated that they’d used a DSM, chuckling a bit at the phrase “hand-guided longarm quilting,” although I know that this label is appropriate. 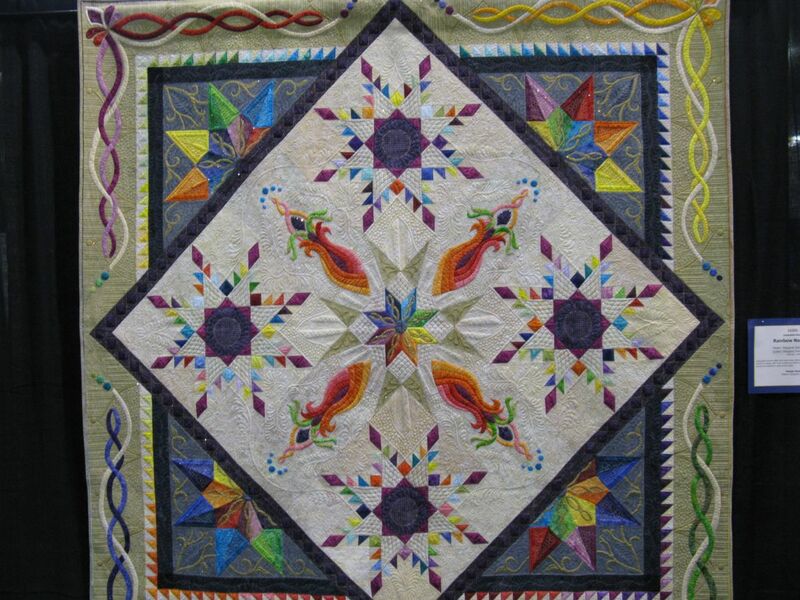 When I read in MaryPat Leger’s artist’s statement that her quilting was inspired by Leah Day’s free motion quilting class, I knew I was seeing a quilt that was done on a DSM. 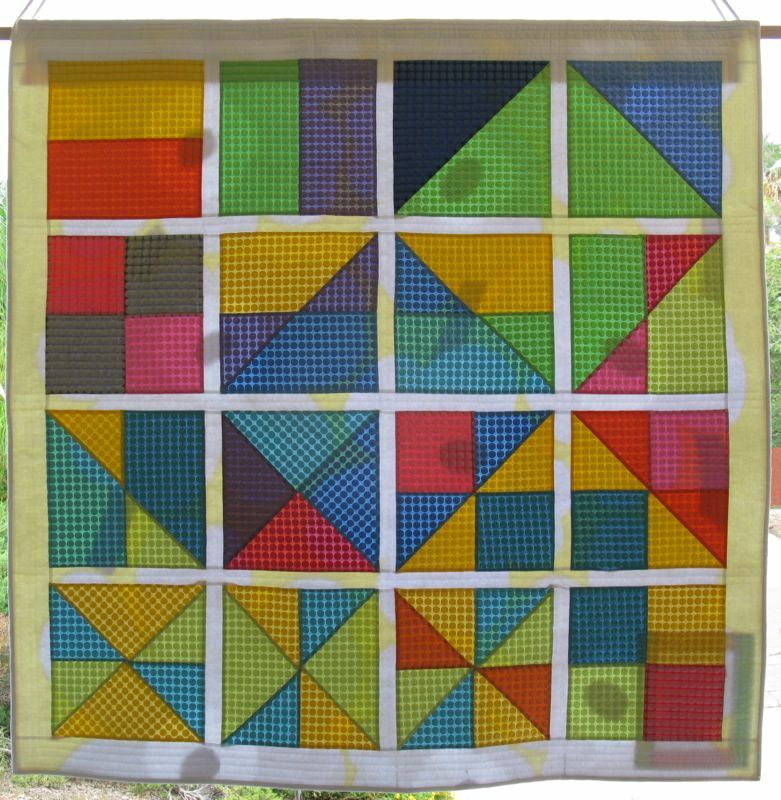 Leger tried out many different patterns on her Mariner’s Circles, and although the next picture is blurry (they have strips of plastic stretched across the quilts so it does make it hard to get good photos), you can see how many different stitches she tried on her quilt. 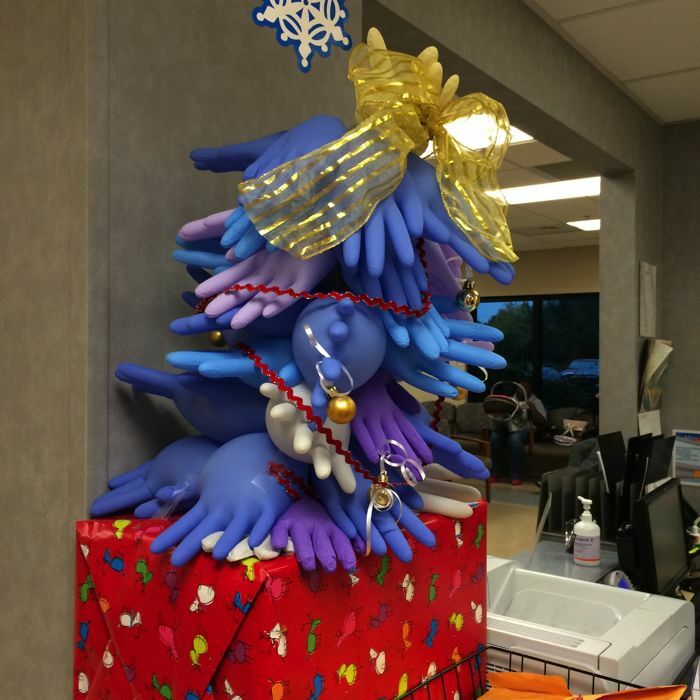 Debra Crine’s been busy. 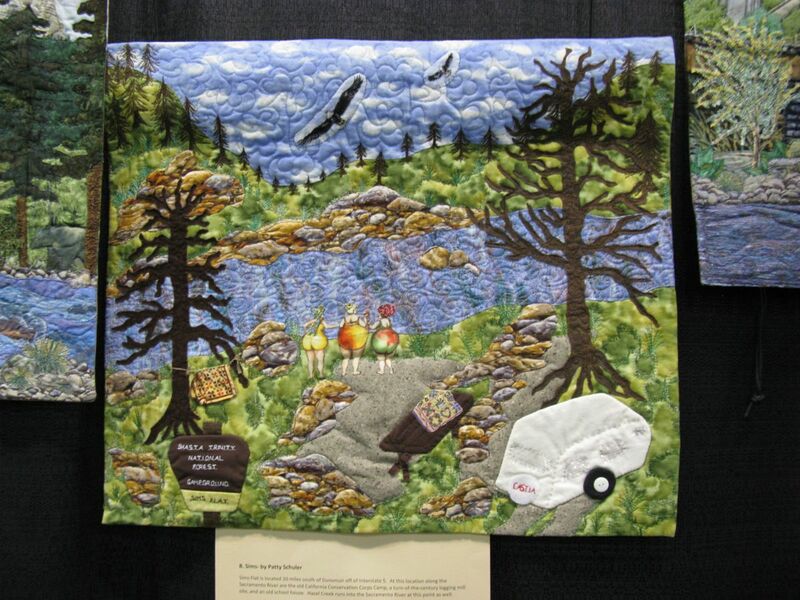 This is another quilt of hers, titled A Taste of Paradise. 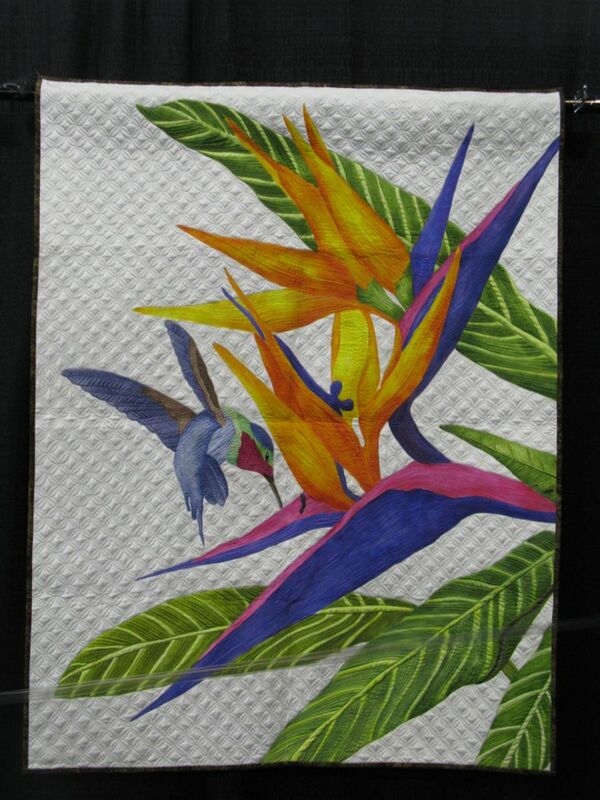 Taken from an illustration, she hand painted the fabric with acrylic paints and a used a variety of threads for the thread painting. 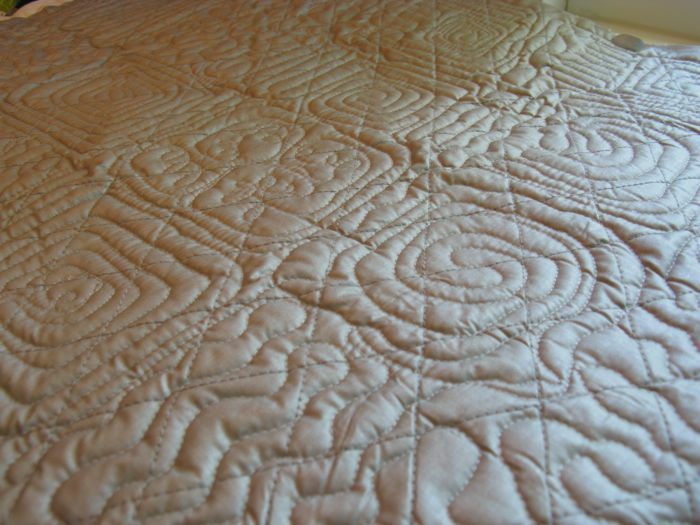 She also quilted it, but no word on whether it was a DSM or a longarm. 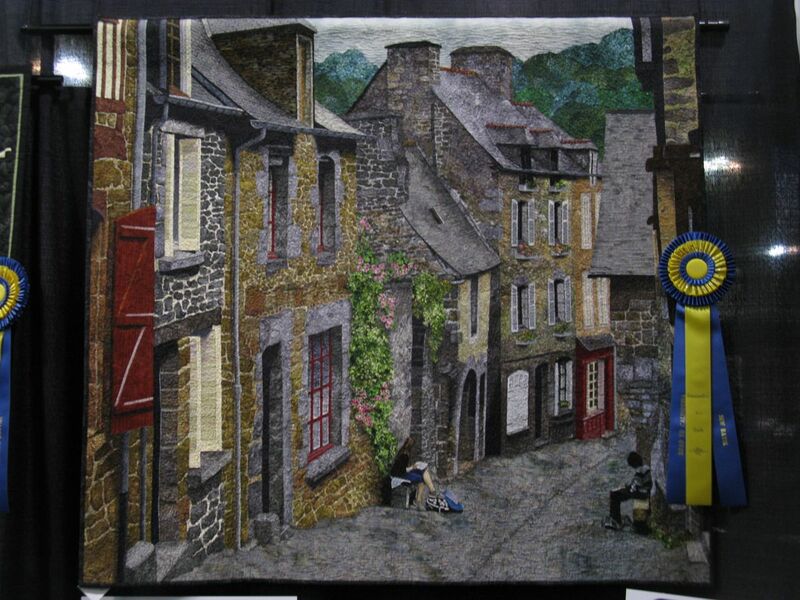 Lenore Crawford came upon an art class of teenagers sketching in the streets while on a trip to northern France, then returned home to create her quilt Capturing Brittany from what she saw. 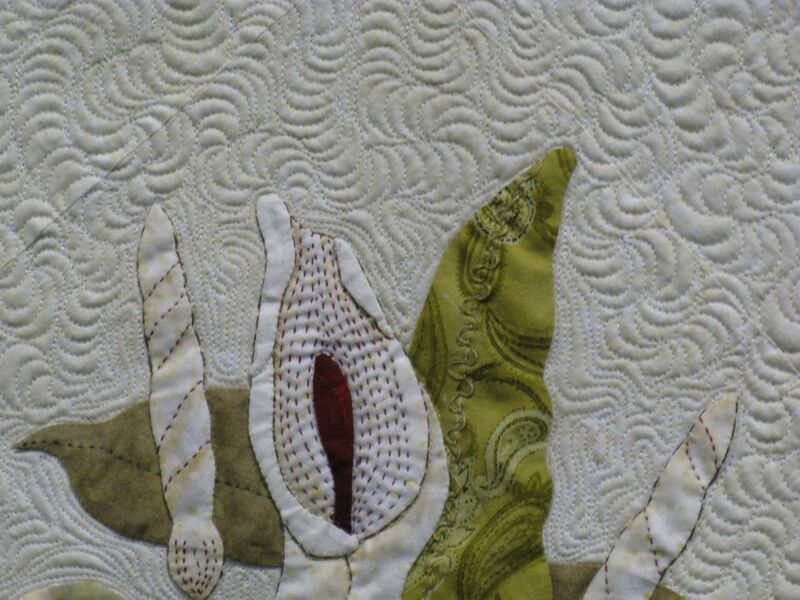 She used raw edge fused appliqué, and quilted it herself. 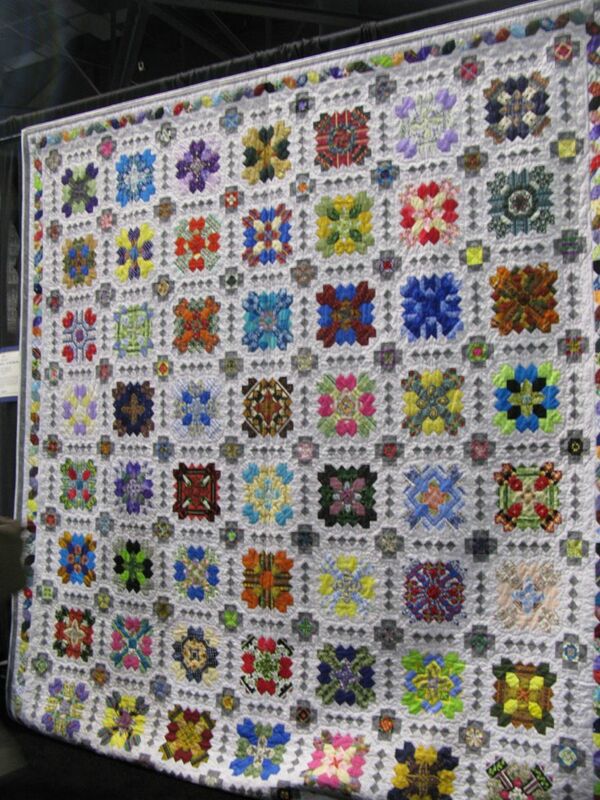 This was another quilt that we were prevented from seeing up close, due to the barriers. 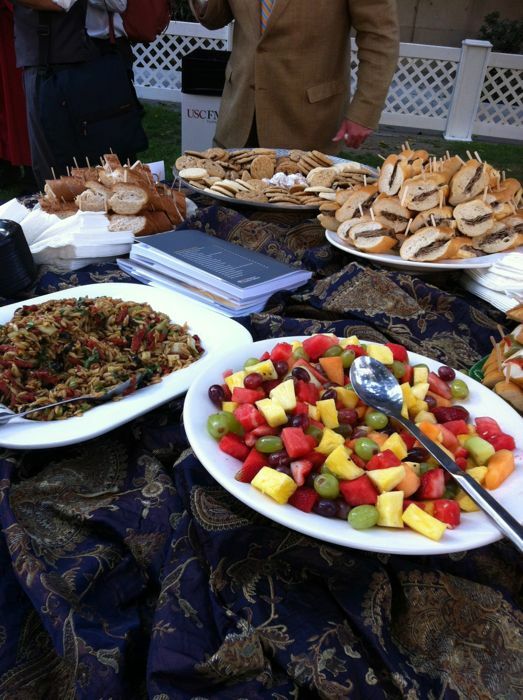 I just wanted to stand there all day, enjoying her scene and her skills at bringing this to us. 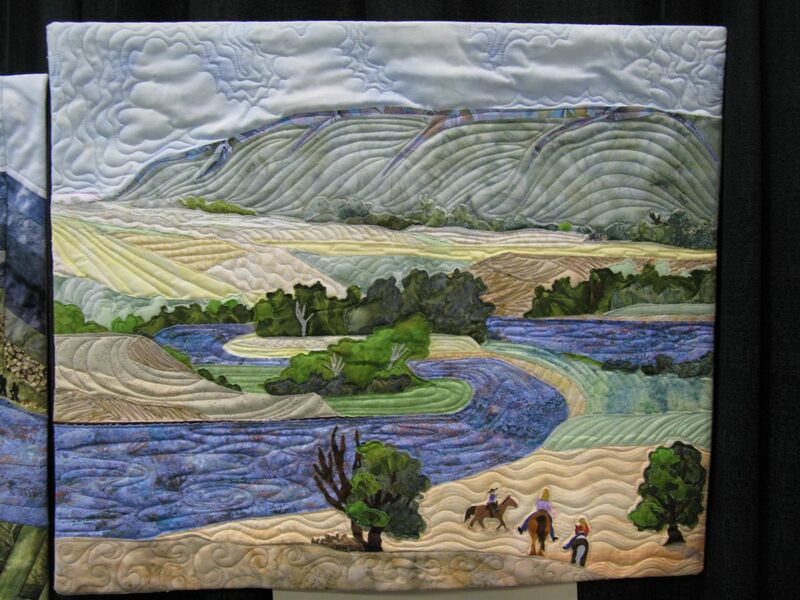 Click on this quilt on the Road website to see it larger. 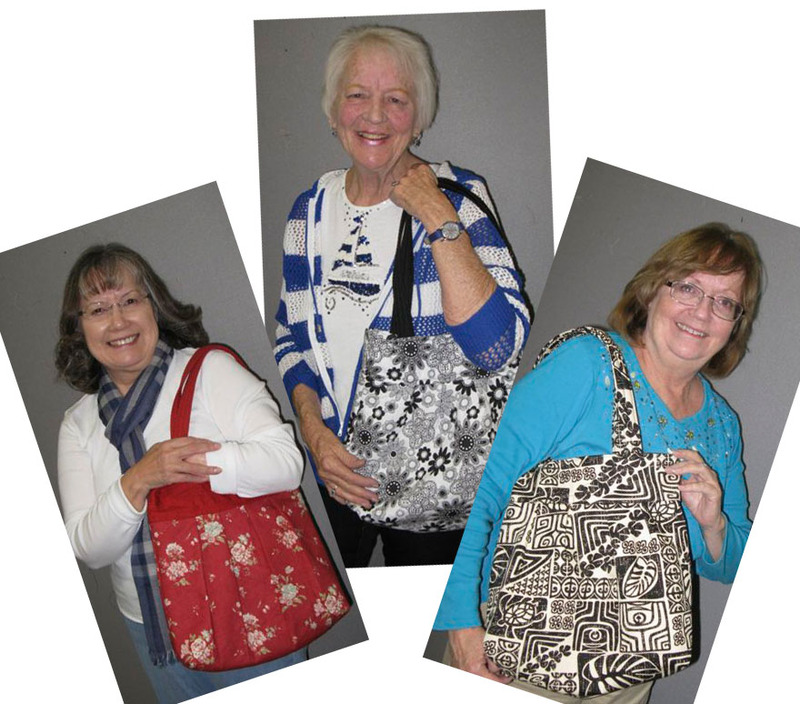 We interrupt this quilt show to bring you an advertisement for more sparkles. 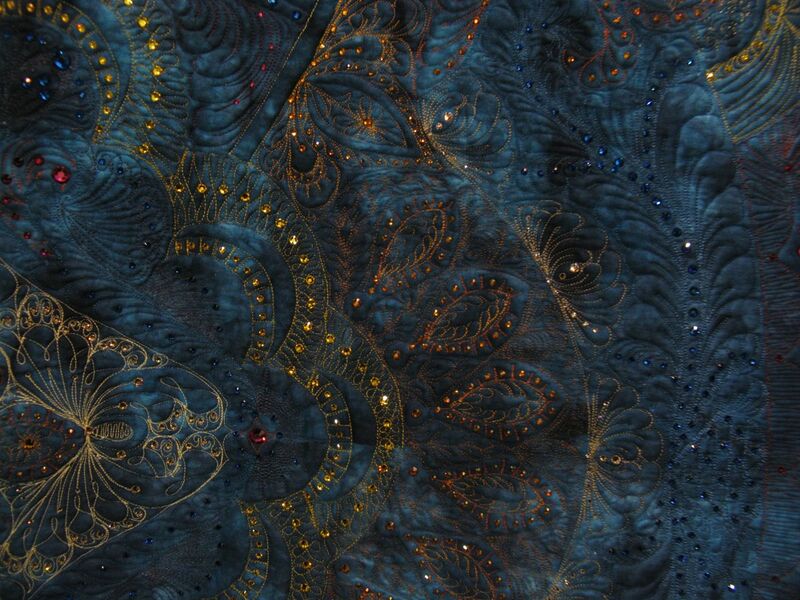 This is the BACK of the quilt, a sign proudly proclaiming “over 22,000” crystals. 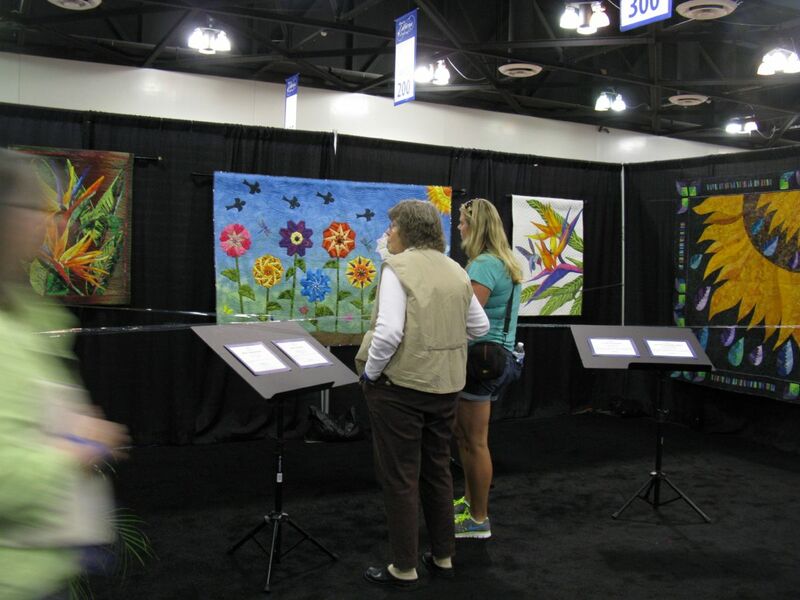 Would it surprise you to know that this quilter had a booth, and was selling crystals? 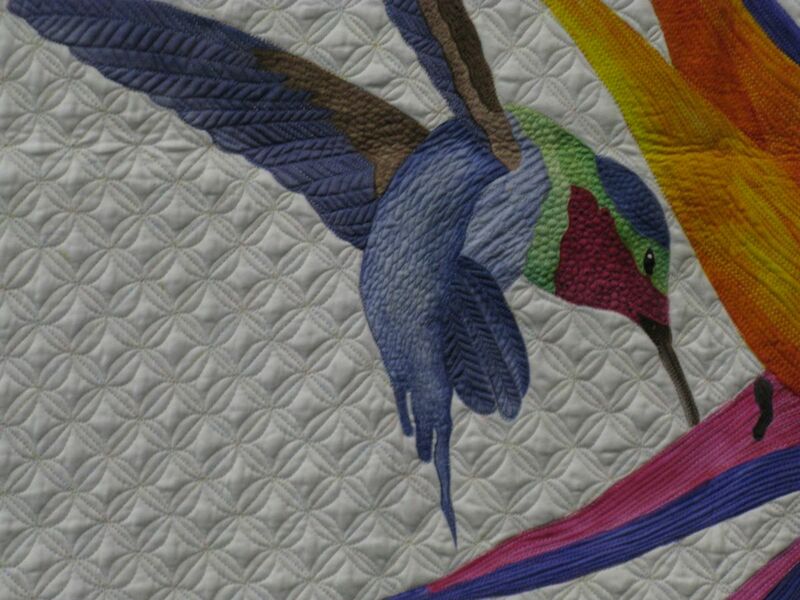 Certainly a masterpiece of quilting and technically perfect with applied crystals, it represents the high point (or low point, depending on your point of view) of the Crystal/Sparkle/Bling phenomena. 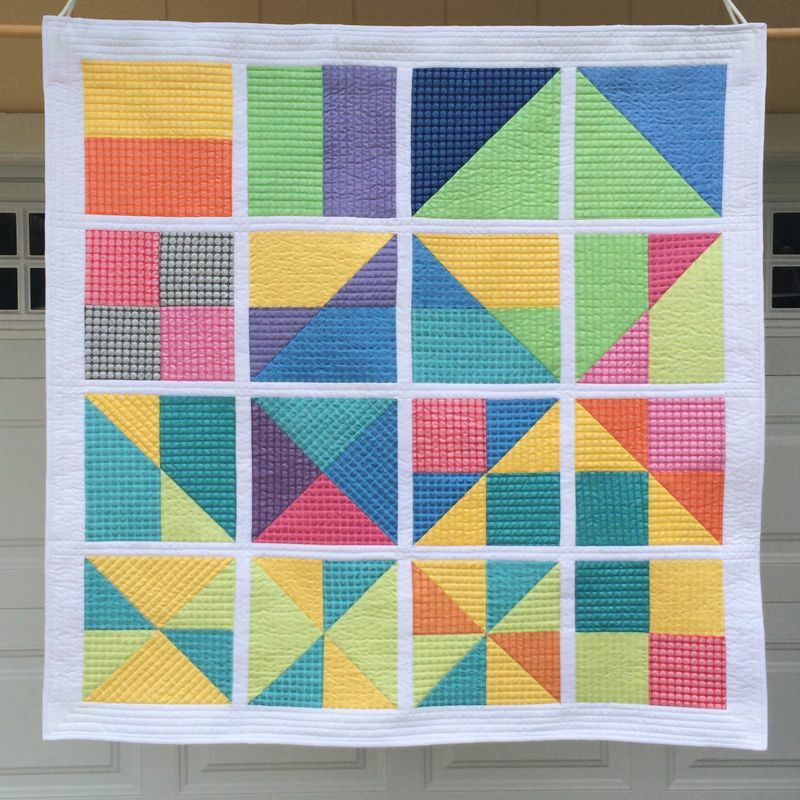 (I don’t know who the maker was because I was not impressed with the front, and I don’t like to give out the names of quilts I diss.) 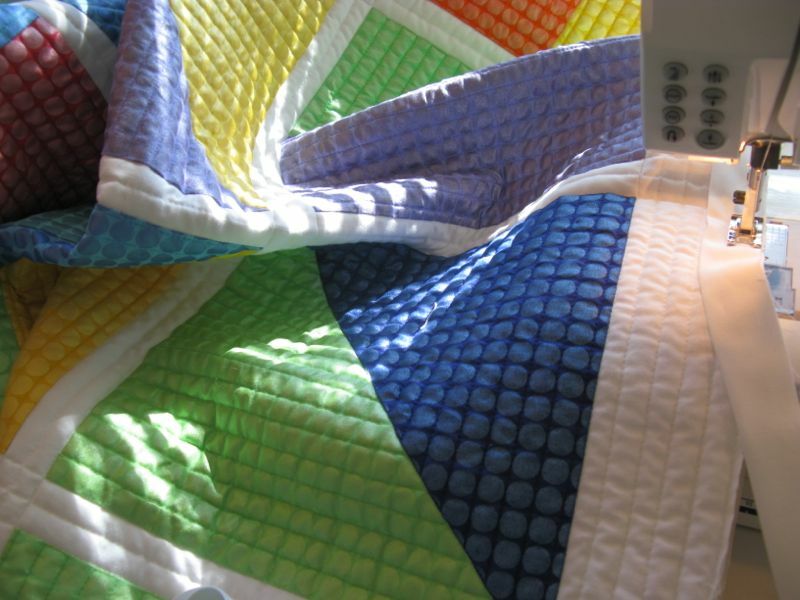 We now return you to our regularly scheduled quilt show. 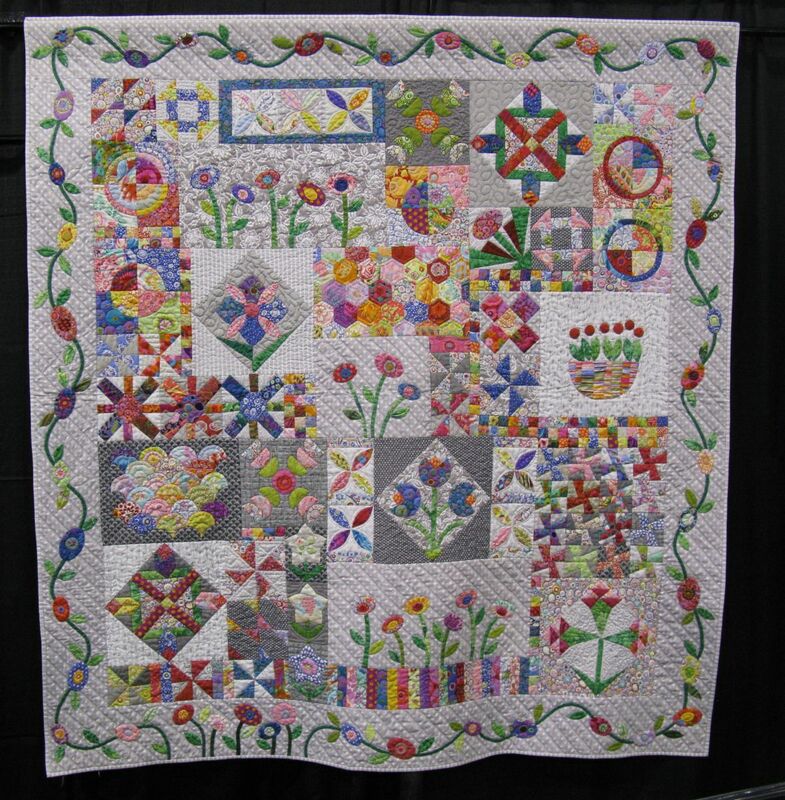 Lorraine Williams, who made this quilt titled All The Pretty Pieces, notes that it comes from a pattern, but doesn’t mention which one. 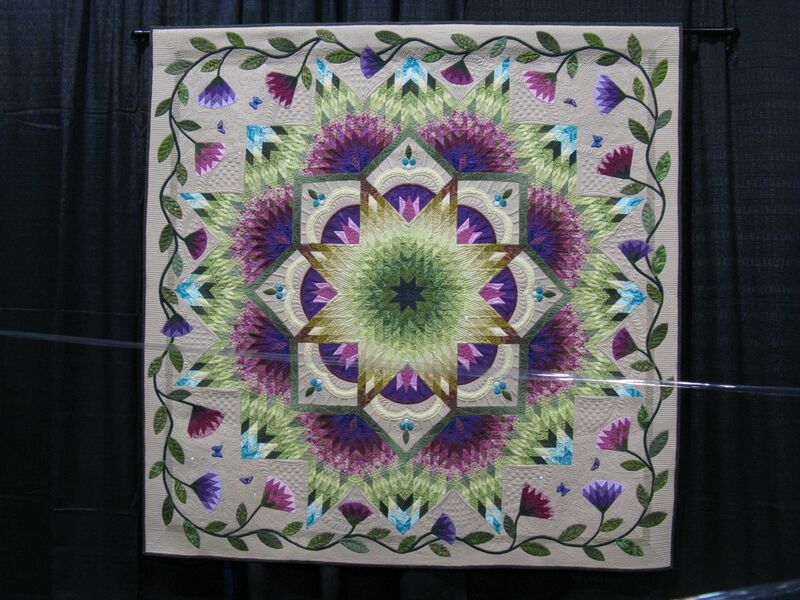 (I’m guessing this one from Jen Kingwell Designs.) 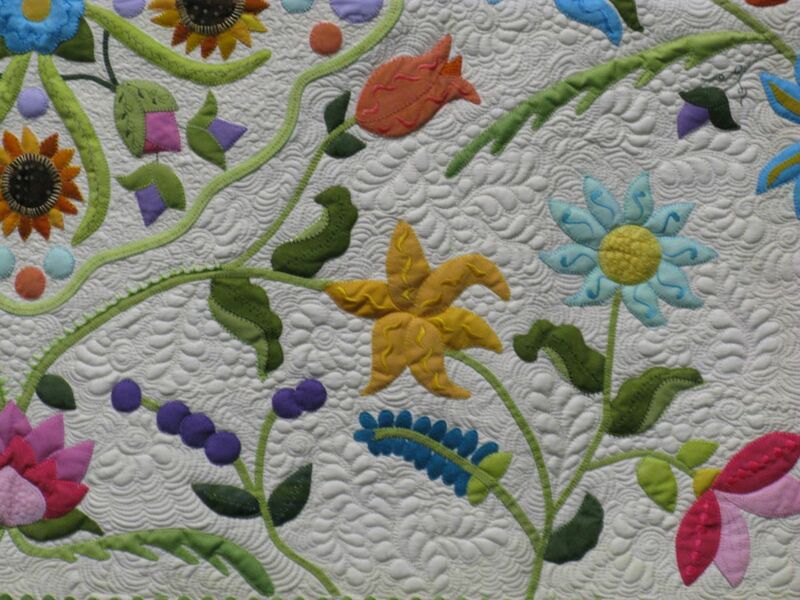 But it was lovely and refreshing and I’ve already participated in helping to make a variation of this pattern for one of our Mid-Century Modern Bee quilters. 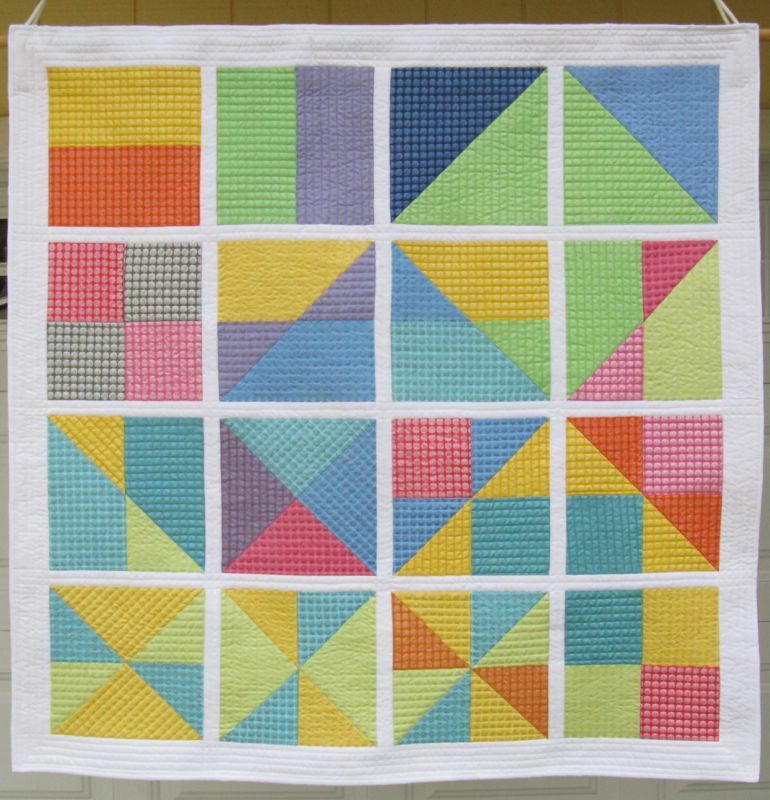 I like the look of this one, as if someone had been piecing blocks all along, and then it just came together naturally. 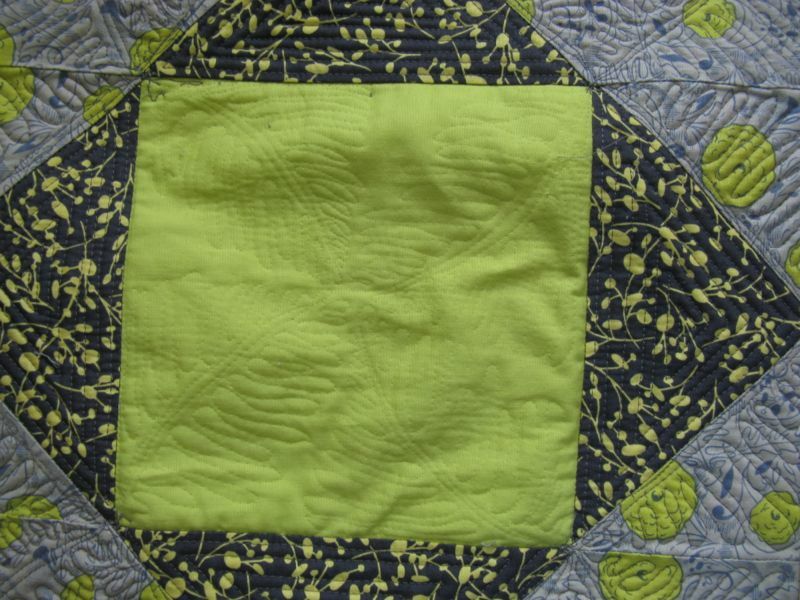 Williams also quilted her blocks differently, letting each stand out. 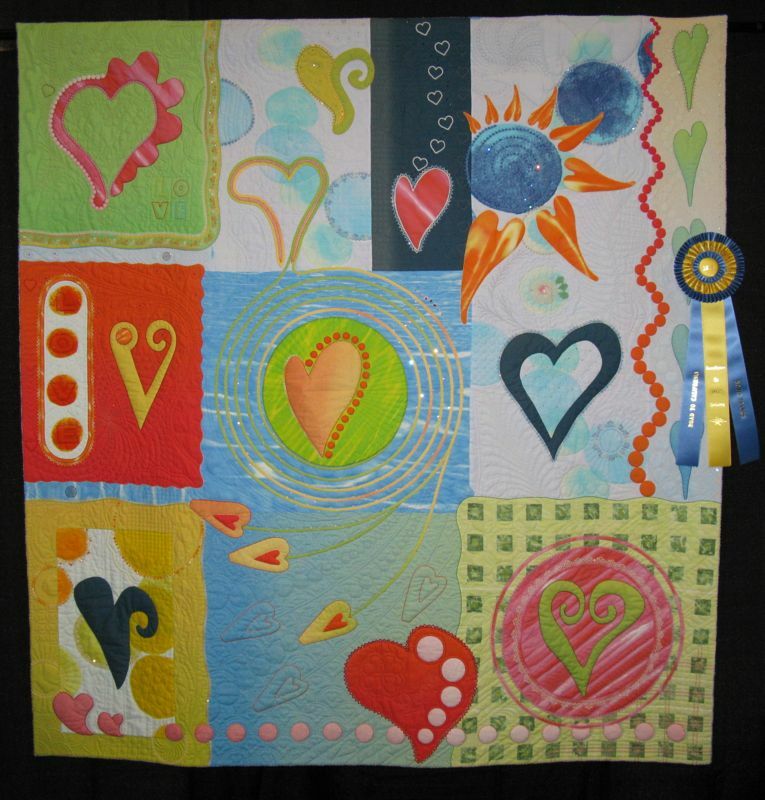 I thought she used varying backgrounds quite successfully, and her color palate was harmonious and brought the quilt together. 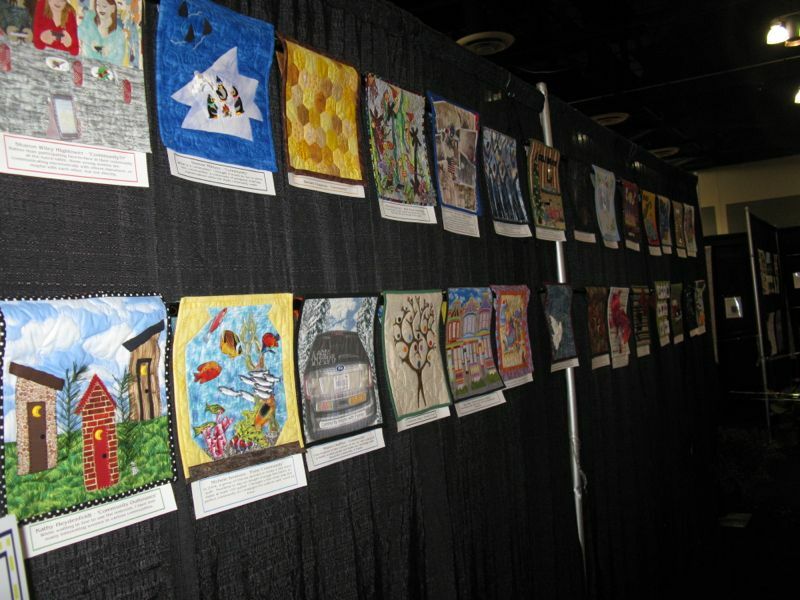 One of the odd (and maddening) things about the way they hang their quilts at Road, is this unfortunate habit of grouping all like things together (p.s. have they ever heard of “habituation?”). 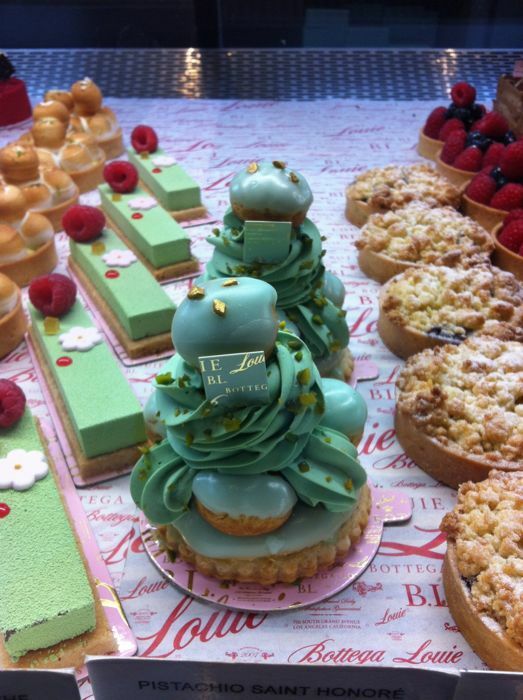 The downside is that a viewer’s eyes begin to glaze over. . .oh, another flower. . . oh, another animal. . . oh, another whatever. . . after seeing 10 of the same subject in a row. The upside is that you can always find them again if you want to find them again “It’s in the flower section,” like we are at a garden show and all the lilies are grouped together or all the orchids. It’s been this way for quite a few years, and nothing I ever say will change that–it’s just one of Road’s idiosyncrasies. But since I’m trying to bring you the essence of Road, that’s just part of it. 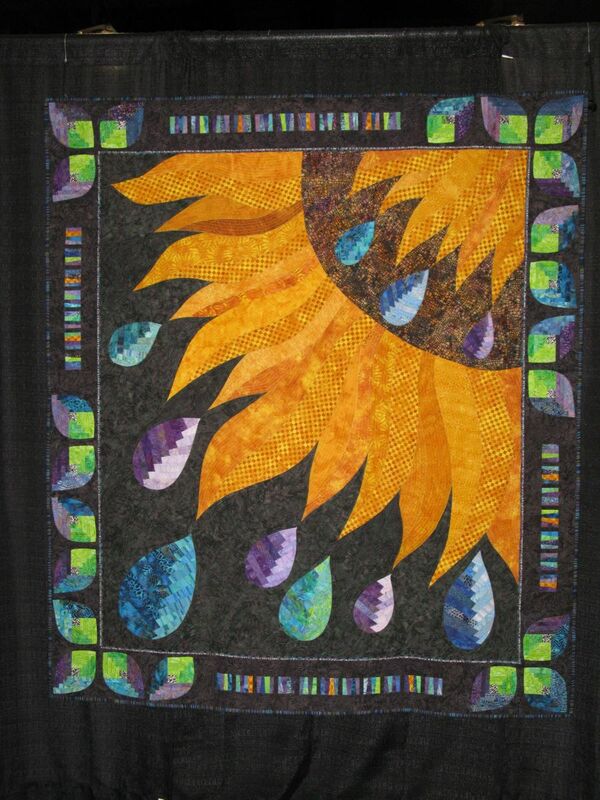 Rainbow Nouveau is by Margaret Solomon Gunn, using batiks, hand-dyes, and gold acrylic paint for accents. 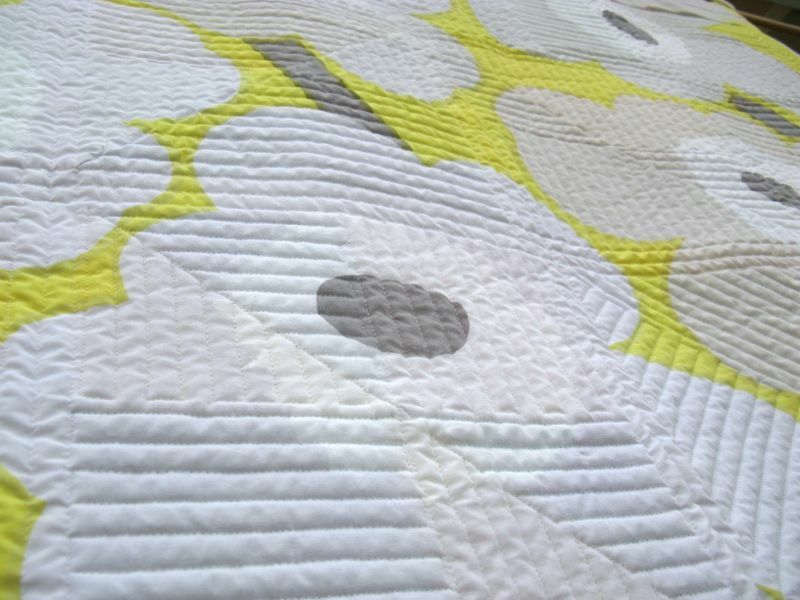 She quilted it herself: “quilting is hand-guided,” meaning longarm machine. 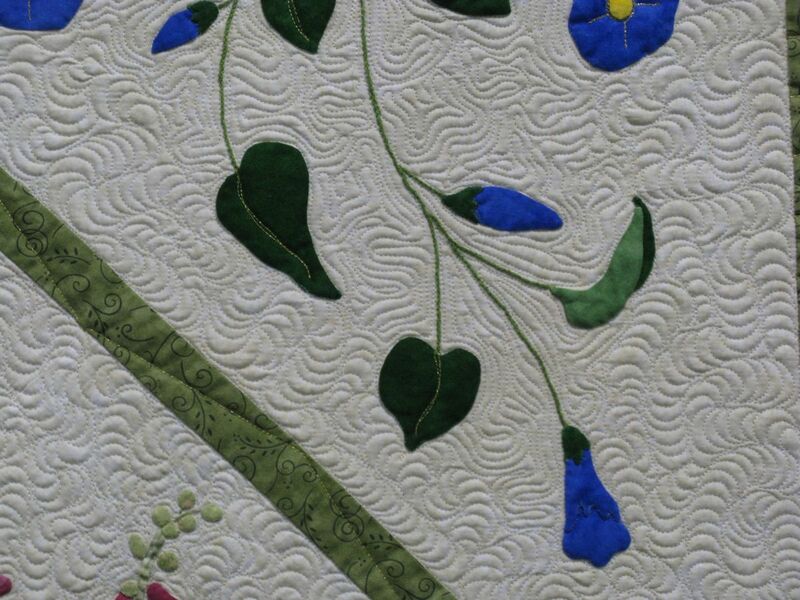 Her original and whimsical appliqué kept my eye moving over the quilt. It was fun to look at. I apologize for not having the maker’s name, nor the title, but I found it on my camera. Something about it caught my eye. If anyone has any information about this, please let me know. 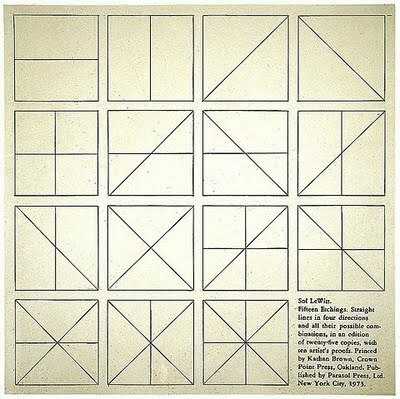 I really liked the use of those four small squares set on point to act as a type of sashing. 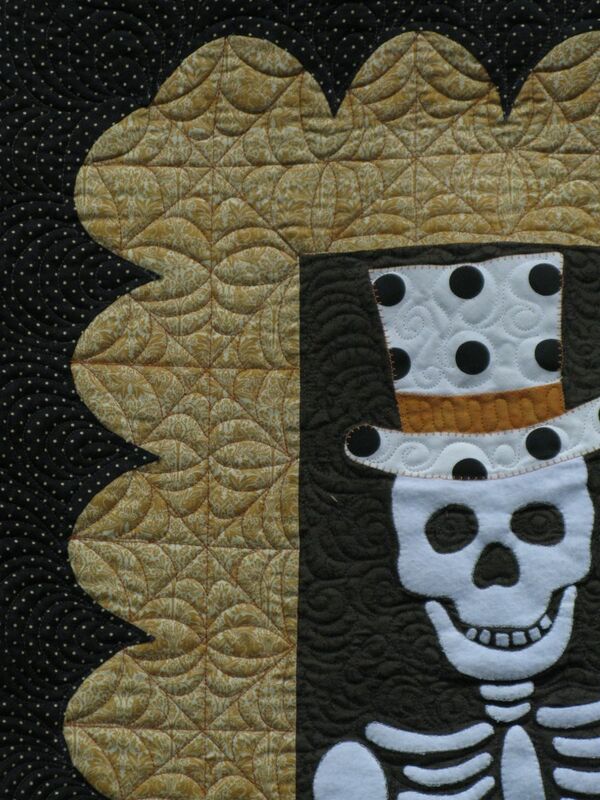 Always fun to have a Halloween Quilt! 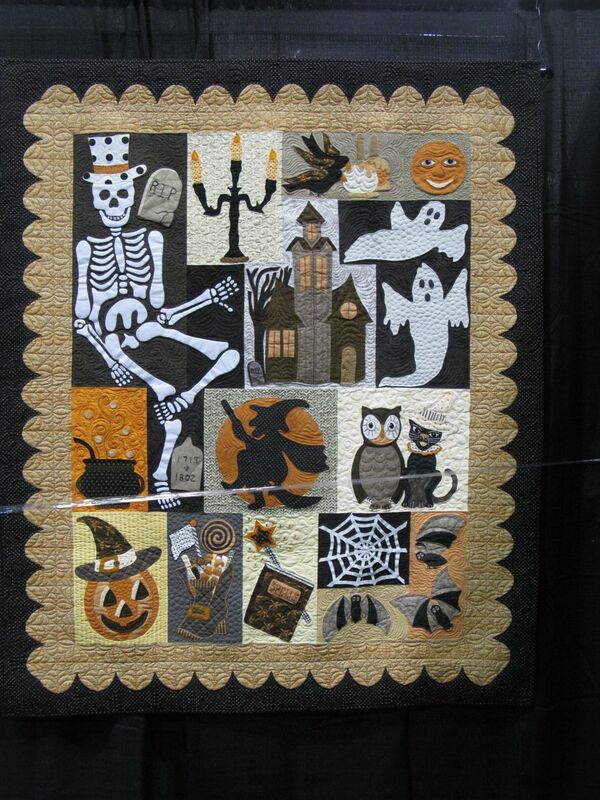 Debra Elenbaas pieced the top and Diane Beauchamp quilted Happy Hauntings. 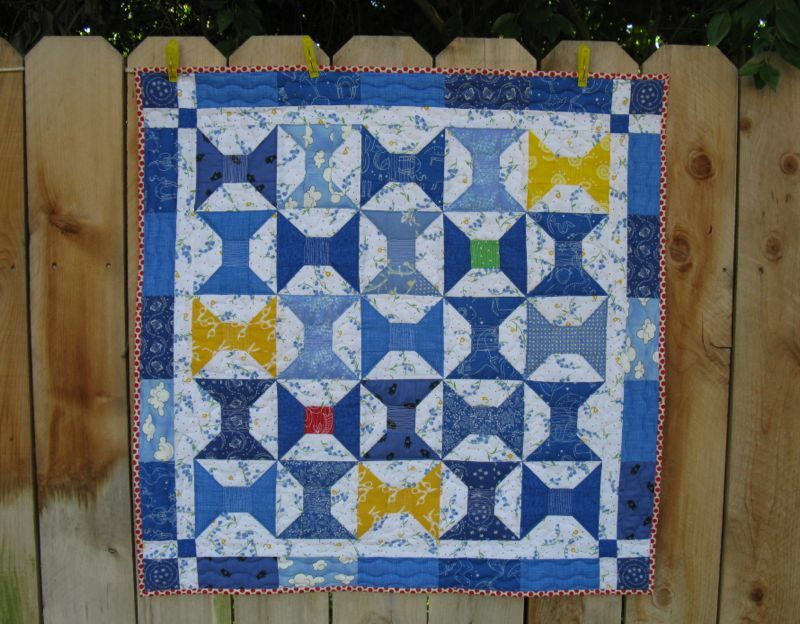 It’s taken from a pattern by Verna Mosquera of The Vintage Spool, and has lots of appliqué. I thought the spiderwebs in the borders were classic! 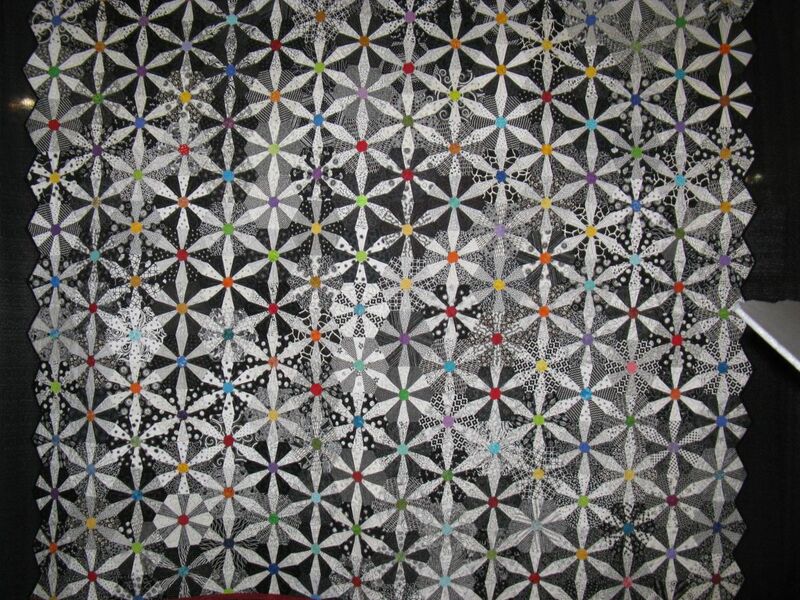 Kay Laboda made and quilted Stars to Light Your Way, a black and white quilt where each block is different from the others. 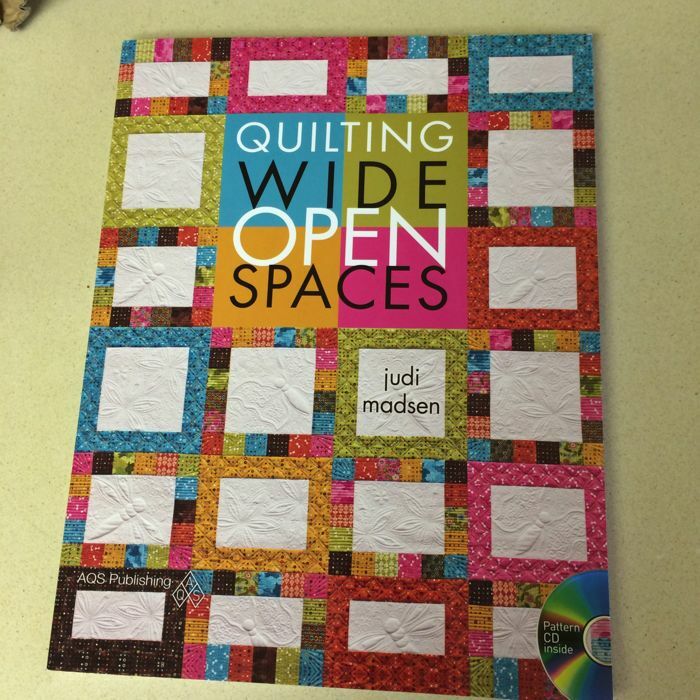 She says she “loves paper piecing” and gave this to her son and new daughter-in-law. 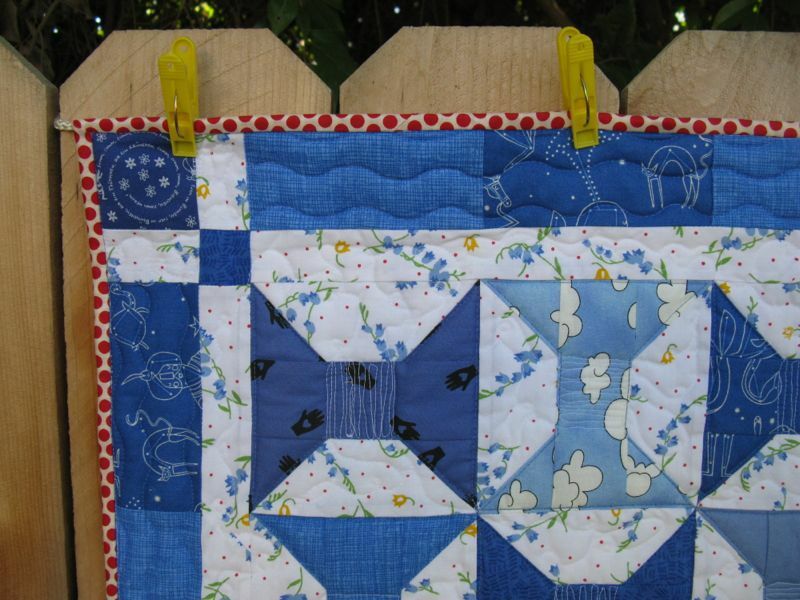 I’m going to close out this post (there’s more coming–stay tuned) showing one reason why there are fewer and fewer judged quilts at Road. 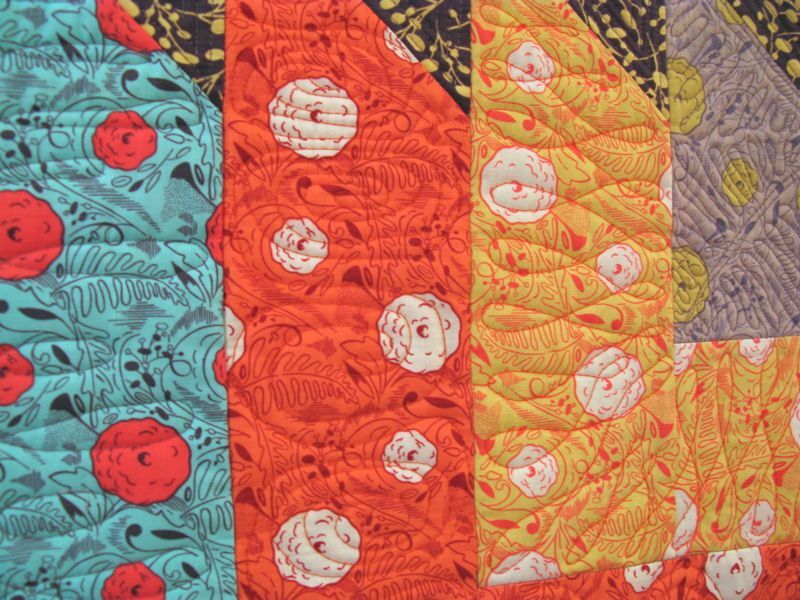 It is because these collections of quilts — sponsored (read:$$) by a shop owner or a store or a corporation — have become numerous. I counted about five different ones, but here’s two. This one was huge (I’m only showing half of it) and had mounds of white fluffy batting to denote “clouds” as this show was about angels. 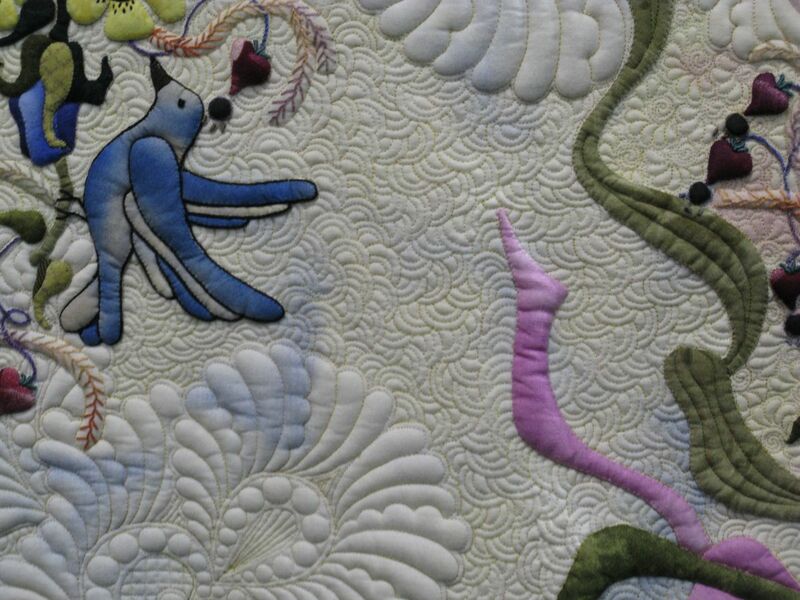 Some of the quilts were interesting, but many were not. Wasted space. 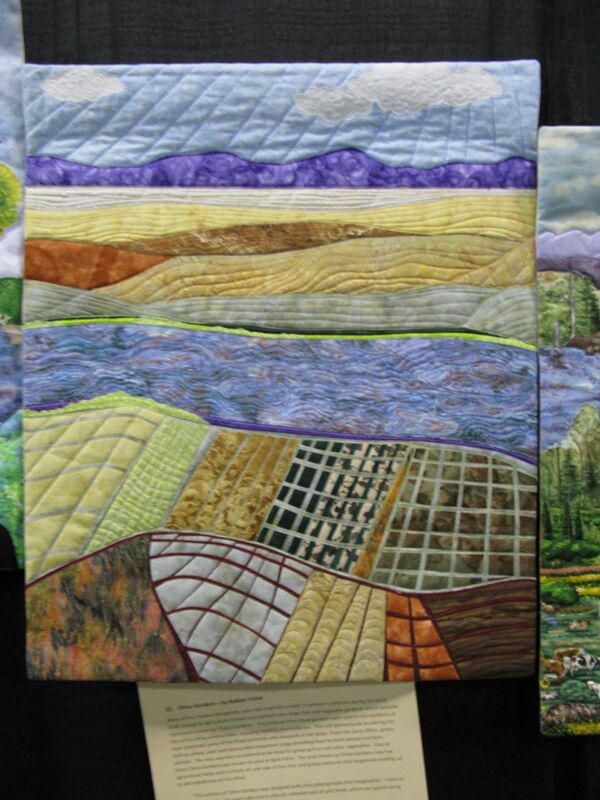 Because I’m involved in an on-line art group, I took time to look at this gallery of “art quilts,” also 12″ square. I thought some were interesting, but many were not (sound familiar?). Some wasted space. 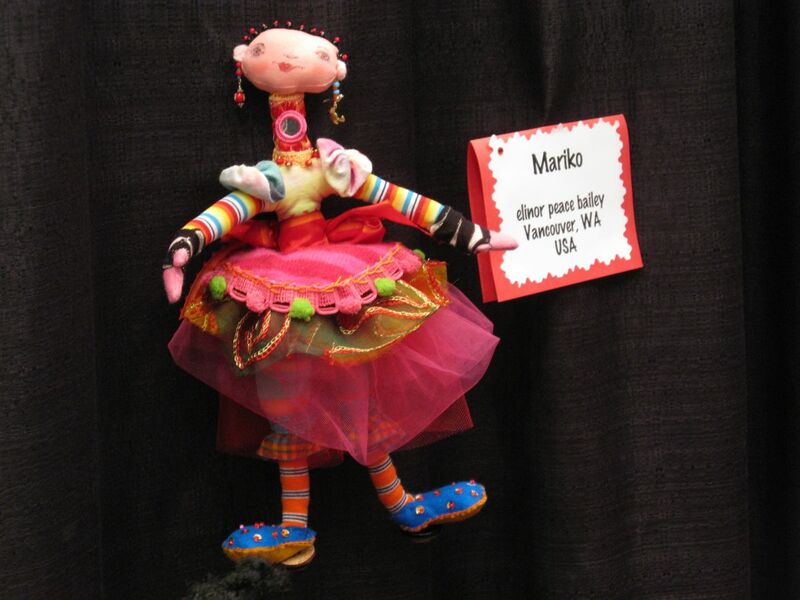 And one doll from my favorite doll maker: Elinor Peace Bailey. She’s the best. 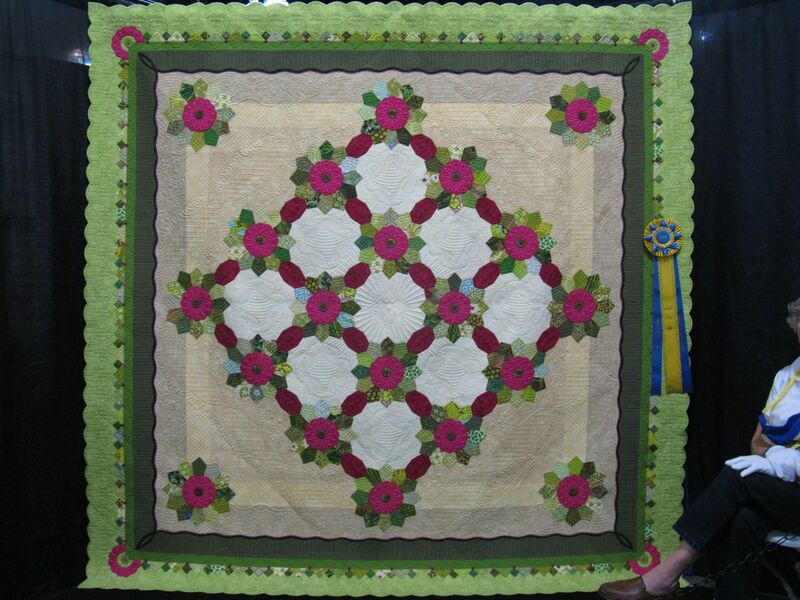 This traditional Dresden Plate design is updated in a pink and green setting with central blocks to allow for fabulous quilting. 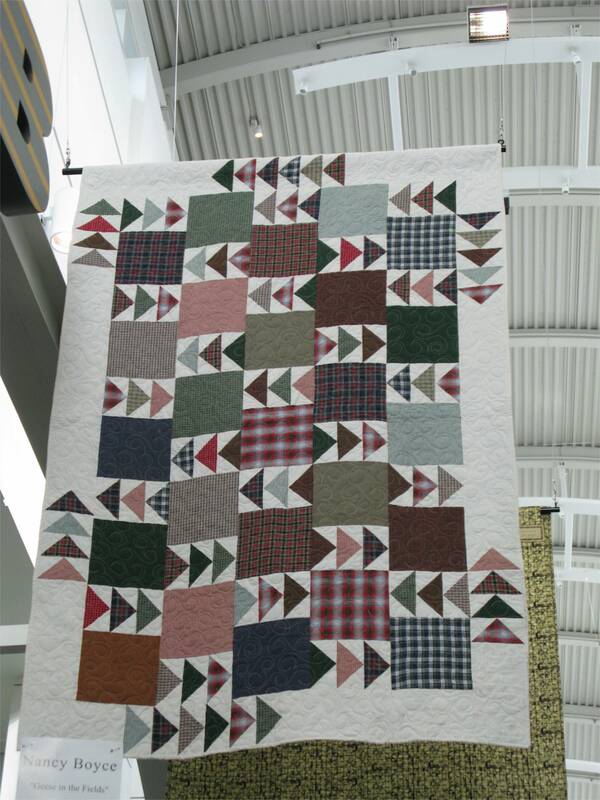 Quilting designs are “hand-guided.” Margaret Solomon Gunn titled this Big Bertha, and it was a stand out quilt, as you can tell by that fancy ribbon hanging on the side. 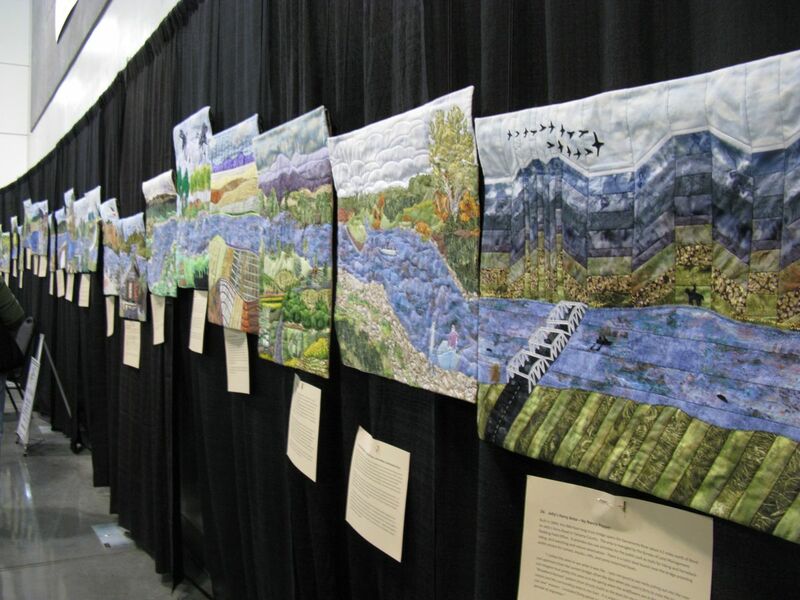 At the front of the hall, just behind the harpist selling his CDs, was this exhibit which was a communal effort of many quilters. 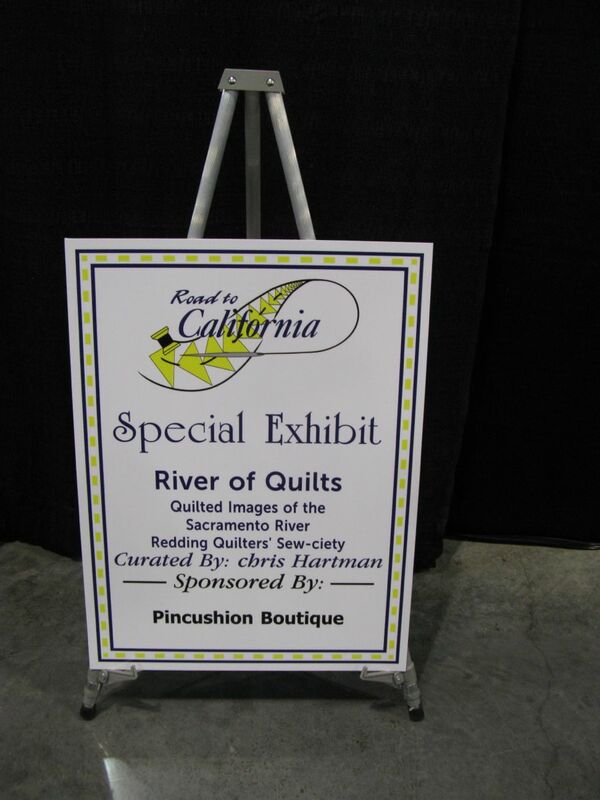 And the Sacramento River ran through it all. 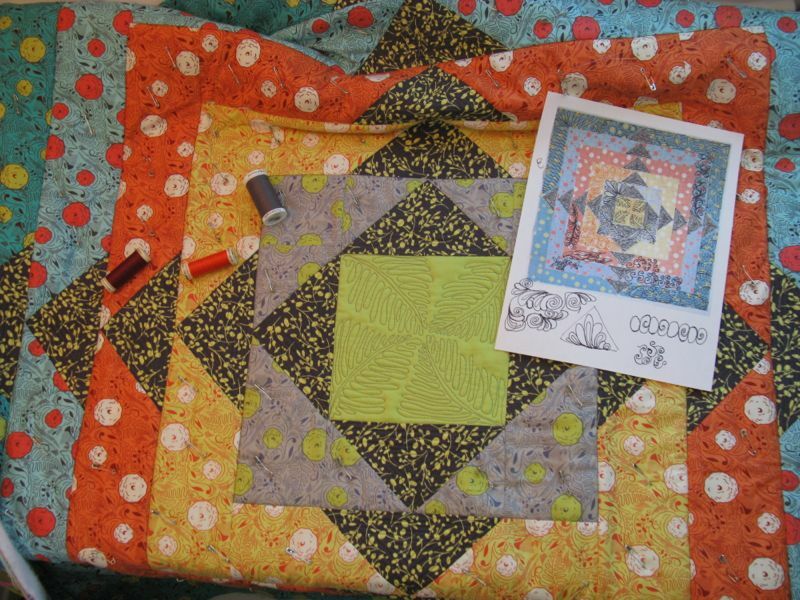 Part II of Road to California 2014 will follow, which will include my favorite quilt and my nominees for the Most Ugly Quilt (I actually have several this year). 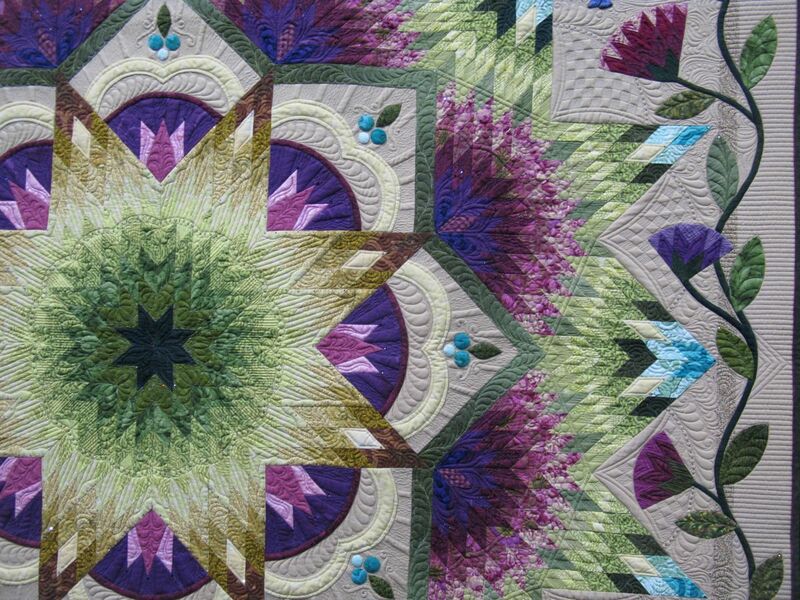 I just found out that the Quilt Inspiration blog has also liked some of the same ones I have. Click *here* to see their first post, then follow the links to their second post. 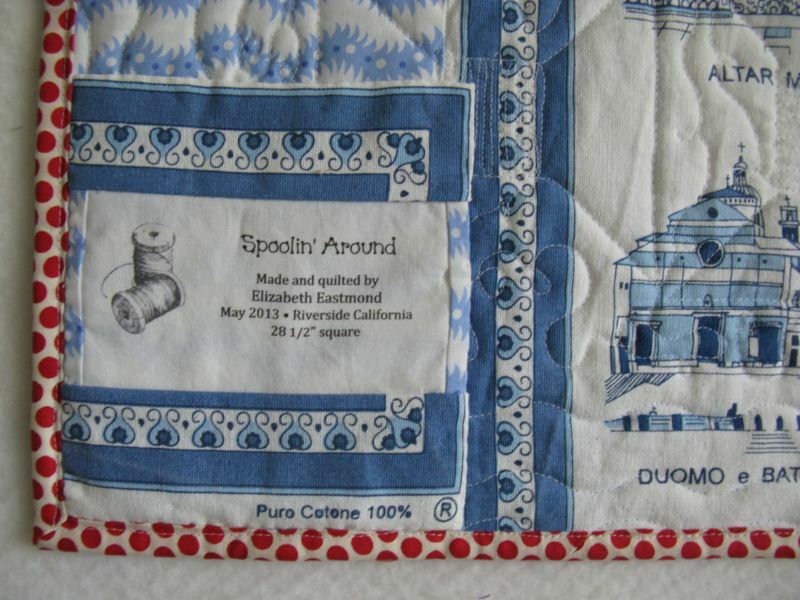 Posted on May 21, 2013 by Elizabeth E.
This is my latest Schnibbles quilt: Spoolin’ Around. 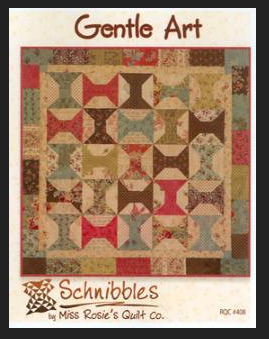 Sherri, Sinta and I assume, Carrie, pick the Schnibbles pattern we are going to use, but then we all go to town putting it together in our own inimatable way. I changed up the borders a little, because I wanted mine to all line up a little more, creating a different corner look. 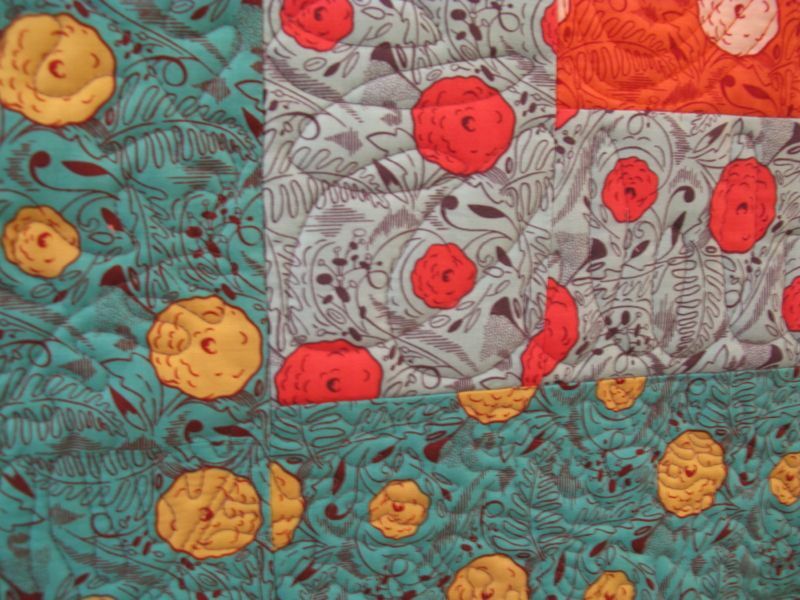 Read *here* about my fabrics, including using some sheets from the Porthault design vault. I feel like I’m also creating a Tea Towel series, but really I’m not trying to. 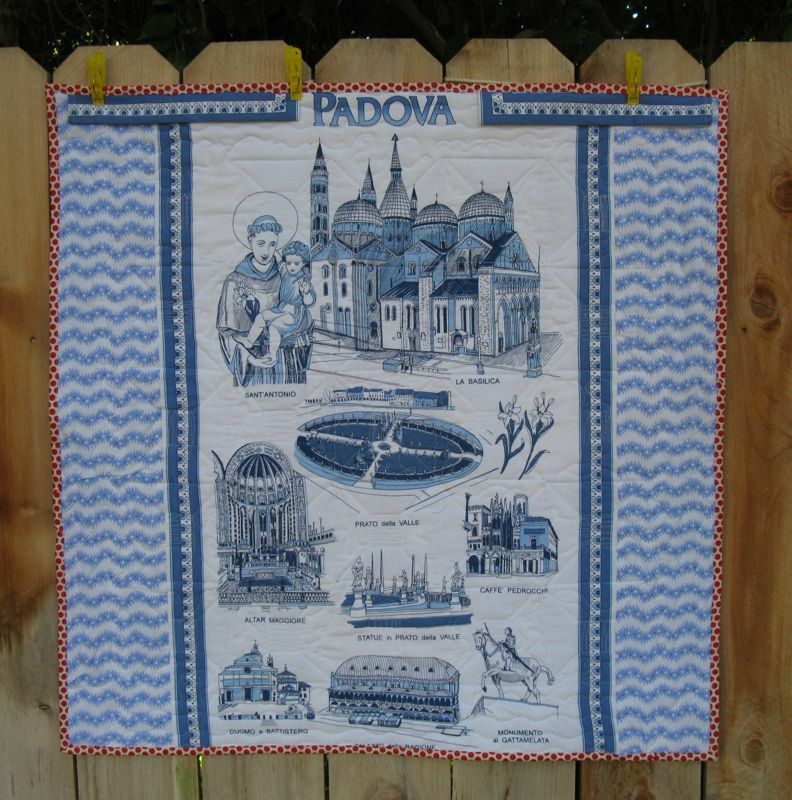 It’s just that this towel from Padua, Italy was blue and white and the top just called out for this to be used here. St. Anthony is a Big Deal in that town, as you can tell by his likeness, his basilica, his . 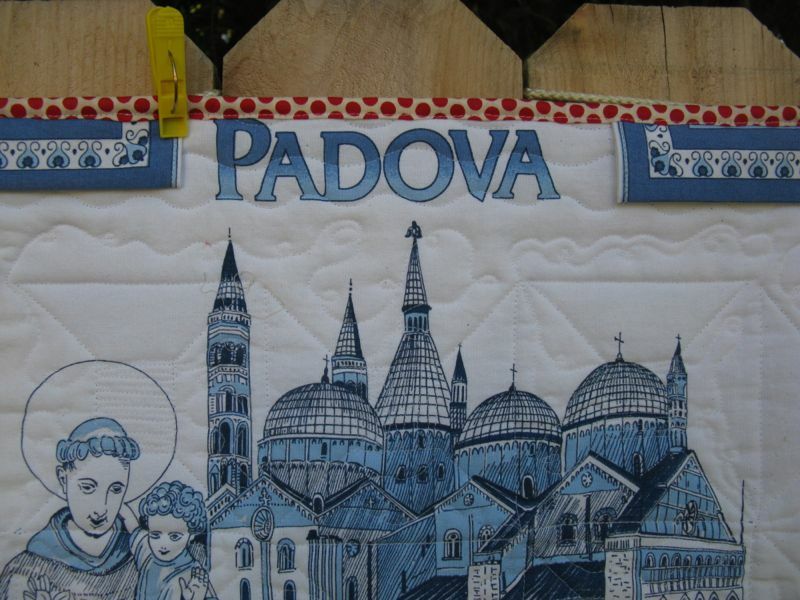 . . We went to Padua to see the Scrovegni Chapel. 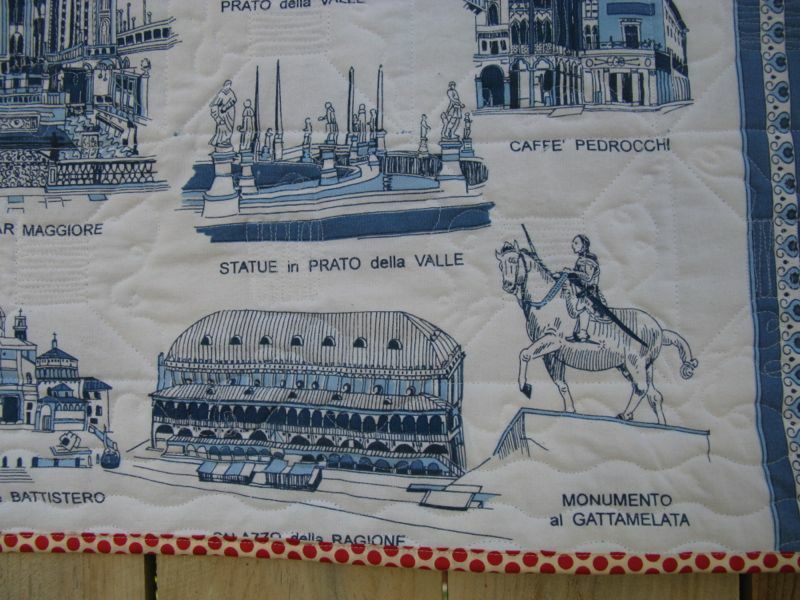 Getting this tea towel was a side benefit. 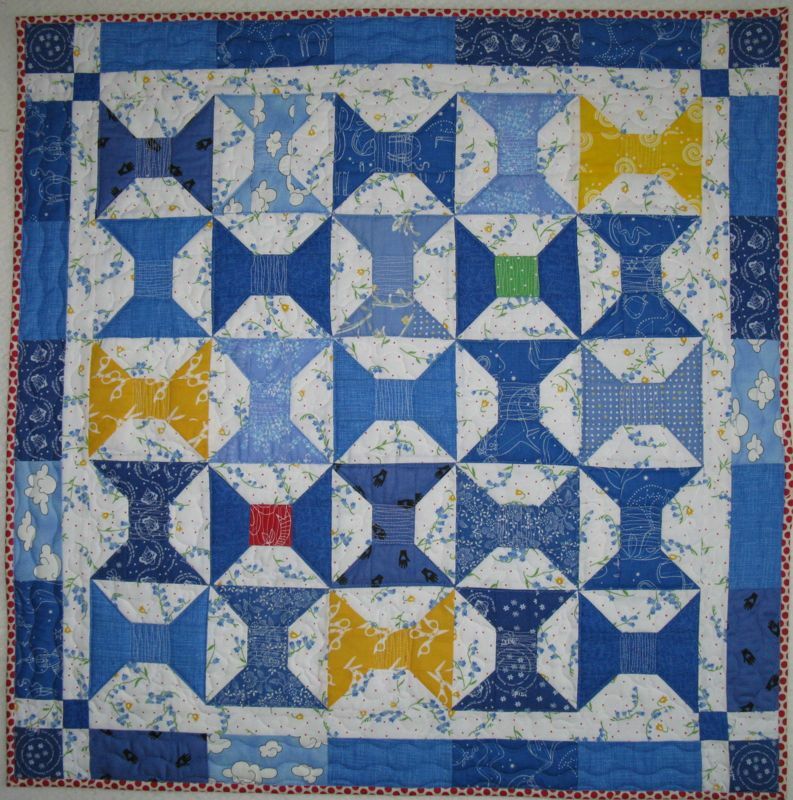 I quilted this during the last week of class, while listening to Barbara Demick’s novel, Nothing to Envy: Ordinary Lives in North Korea, and I quilted and quilted. 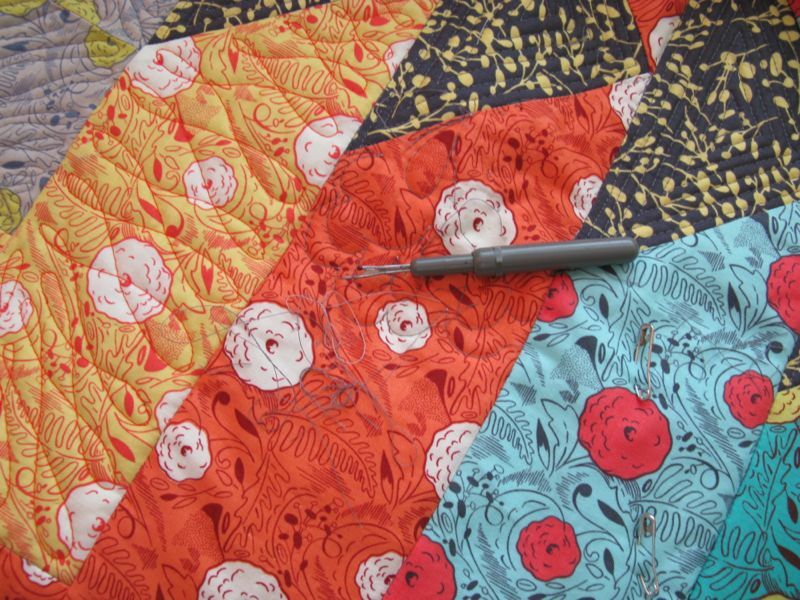 Not perfectly, but that’s also the beauty of making these small quilts–nothing’s so terribly precious about them. They’re fun, not a chore. And I aim to keep it that way, just enjoying the process. 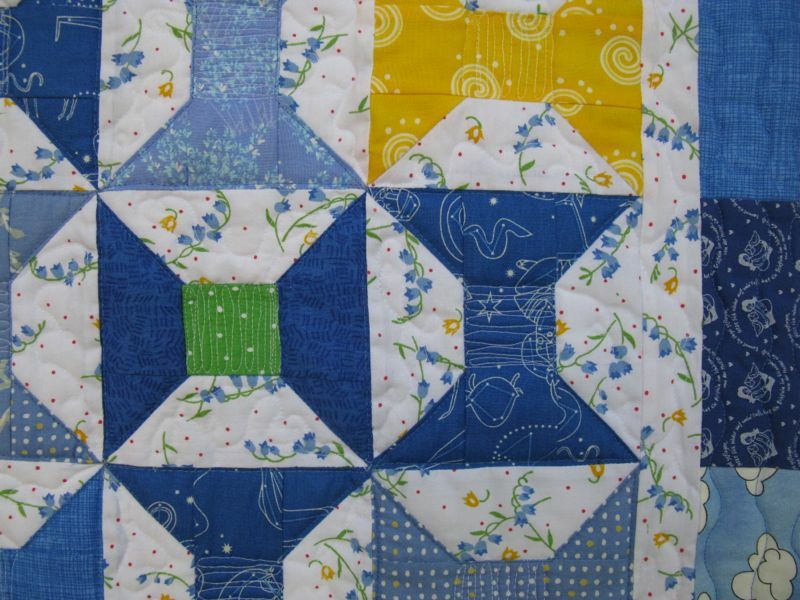 I struggled with the border choices: green soft plaid, or yellow spheres, or red/white dots? 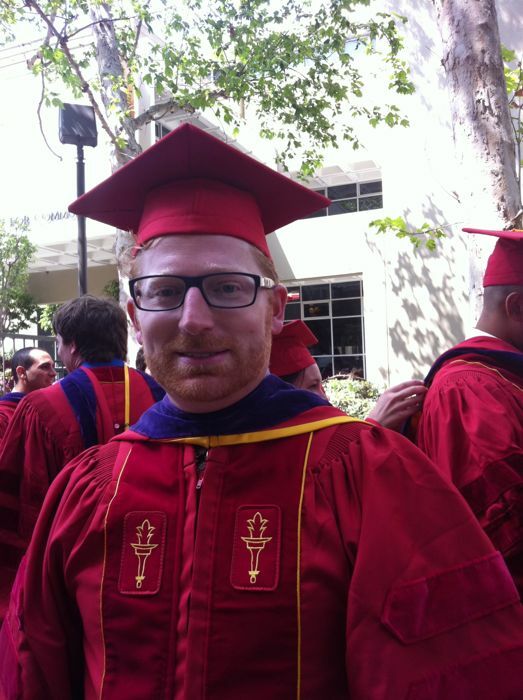 Not sure I’m entirely happy about this, but I did want something that wasn’t so serious. I split the sleeve on the back, because I didn’t want to cover up the words. 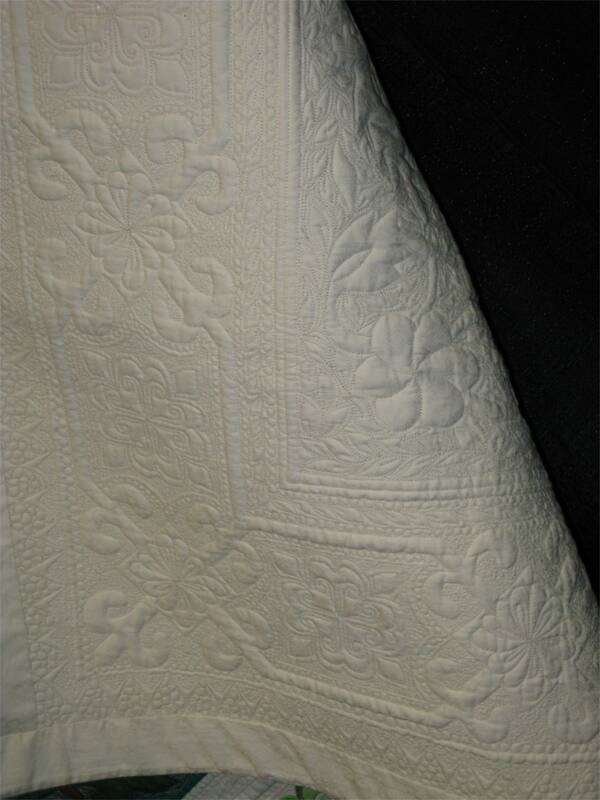 And I kept their label: Puro Cotone, because I liked it. 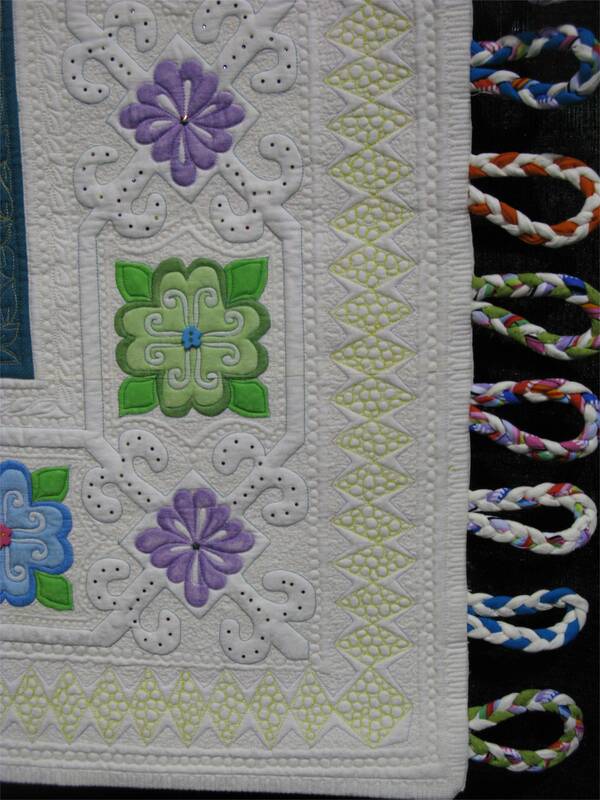 I used bits and pieces of the border that was cut off from the top of the towel around my label. 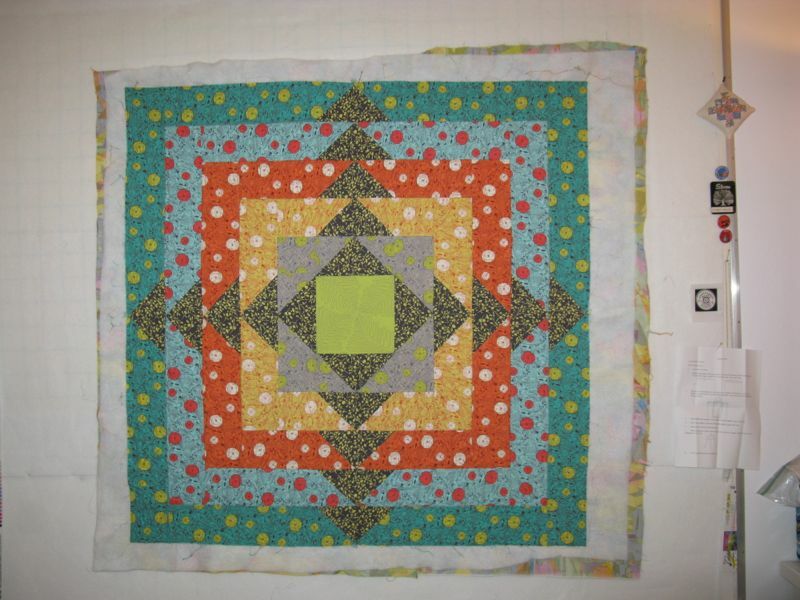 I have to say it’s a bit wild looking, but again–I was having fun, and that’s not a bad thing when you are quilter. And that’s my June 1st deadline Schnibble, finished a bit early! 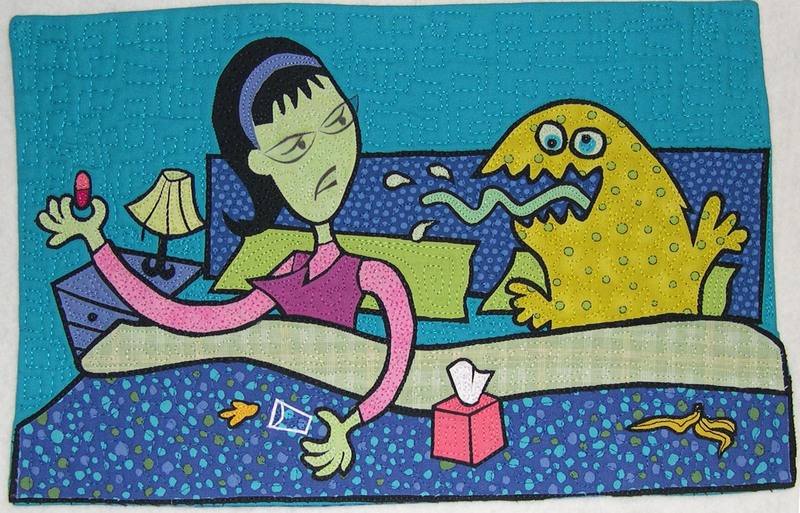 This is #114 on my 200 Quilts list.